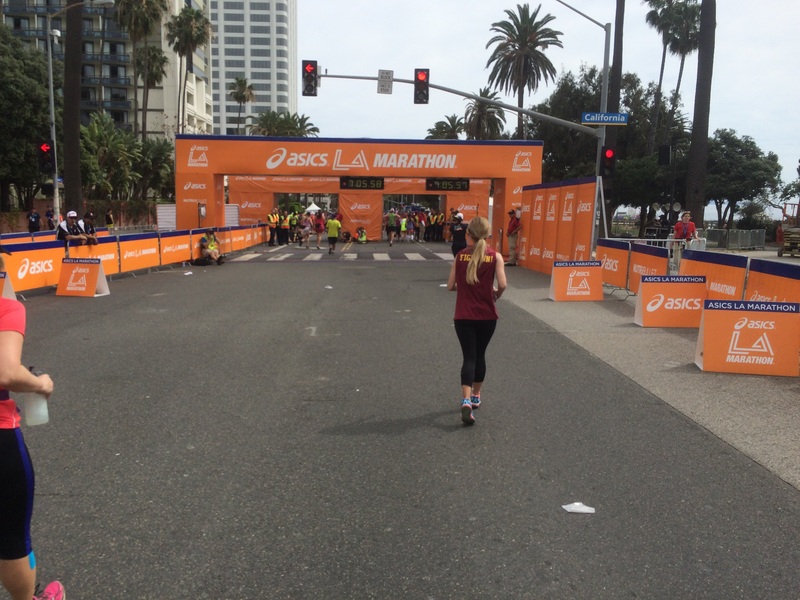 Finishing My Second Full Marathon! When I left off, we were at the relay change point of the race. Time for the second half and the sunshine! 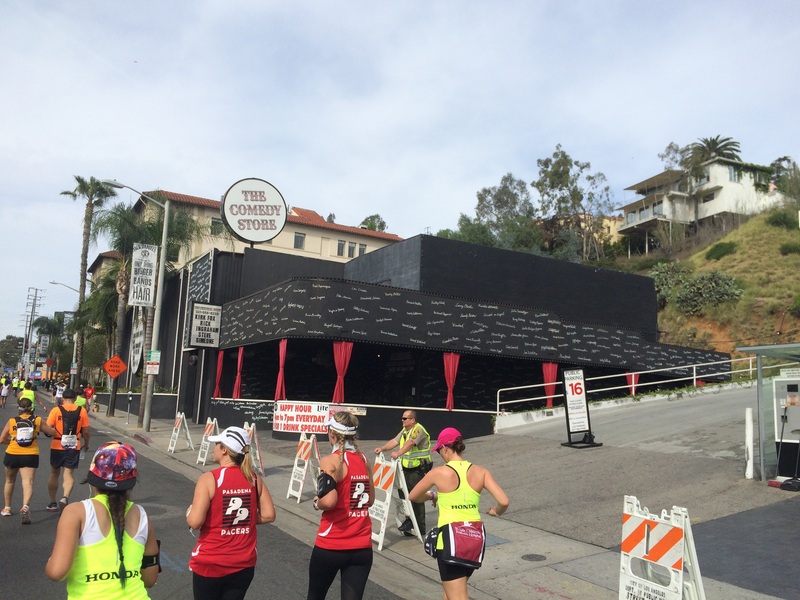 The first landmark of the second half of the race was the Laugh Factory. 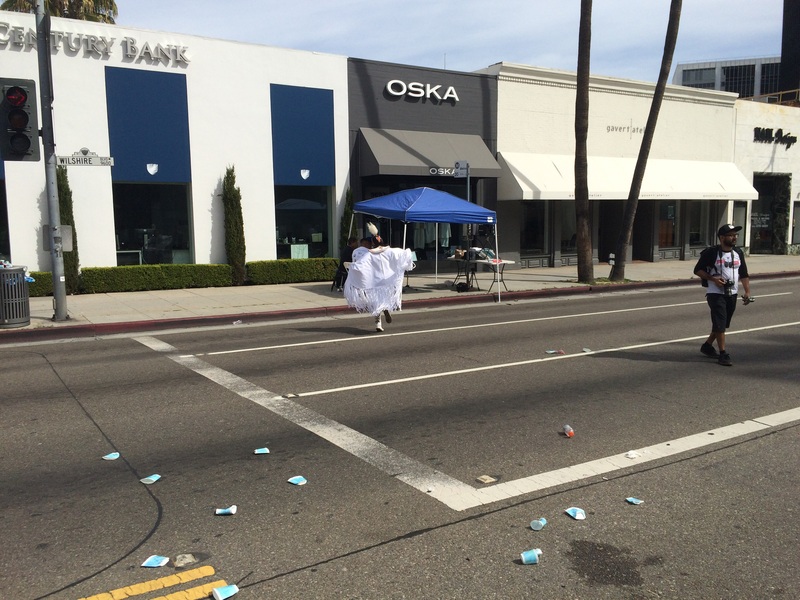 By the way…notice all the cups on the road? 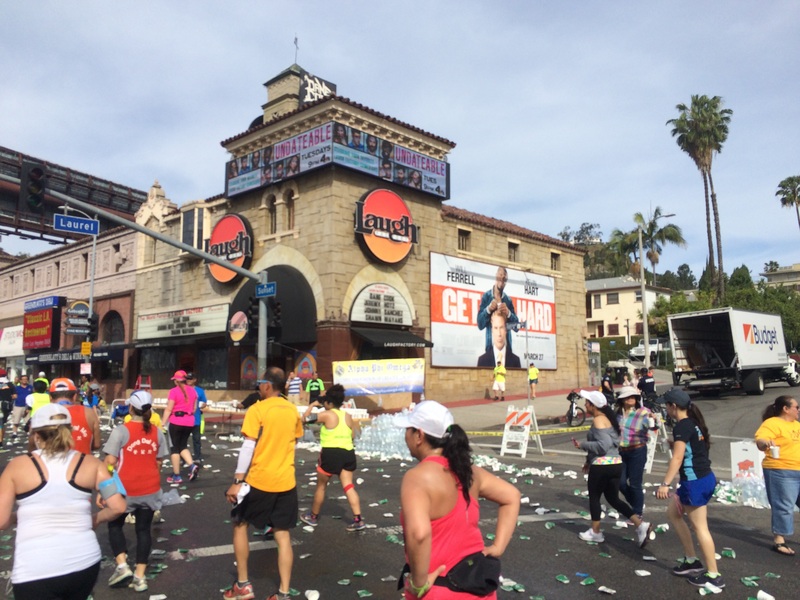 Yeah, 26,000 runners can leave quite a mess. They put out word to the spectators to bring extra food, water, ice soaked towels, and spray bottles for the runners. The spectators listened. Boy did they listen. All throughout the course, there were people with extra fuel for us to keep us going. Mostly, there was a lot of extra bananas, oranges, pretzels, and water. While it was an awesome gesture, the banana peels and orange peels on the road made it a little more dangerous to run. If you think the cups in this picture were bad, imagine a similar scene with banana peels and orange peels. I was extra cautious through those areas. 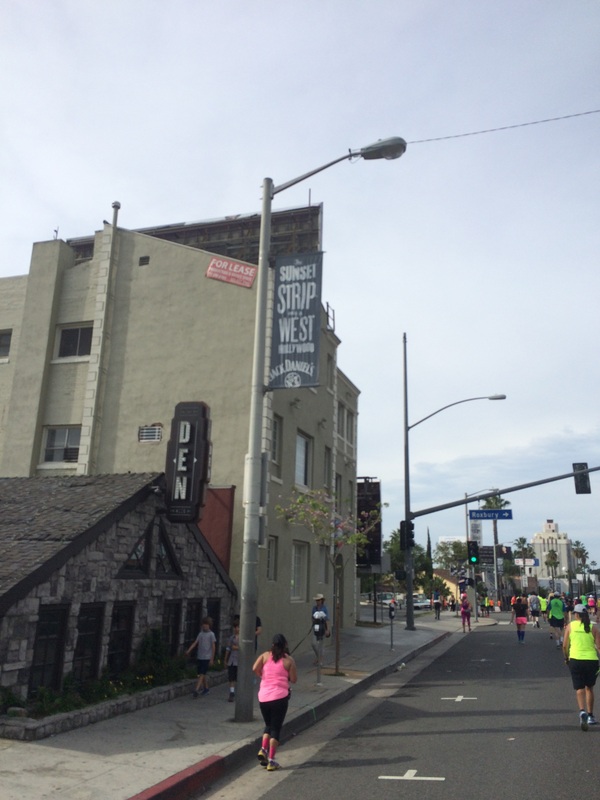 I really loved running through West Hollywood and the Sunset Strip (at least the flat and downhill portions). 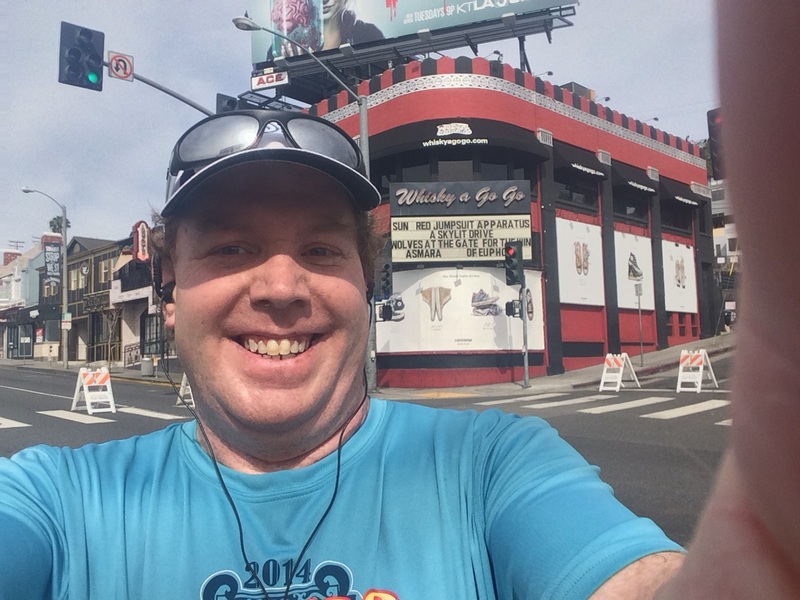 There were lots of fun billboards and some of the businesses had fun exteriors that helped distract from the fact I was trying to run/walk/run my way to 26.2 miles! Look at this fun Hot Dog and Hamburger joint. 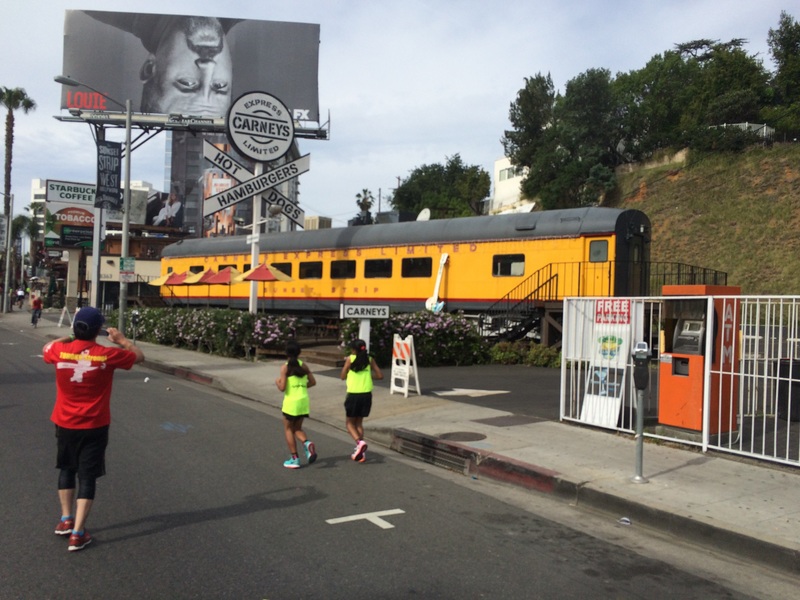 Carney’s has another train car looking restaurant in Studio City that I’ve eaten at before. 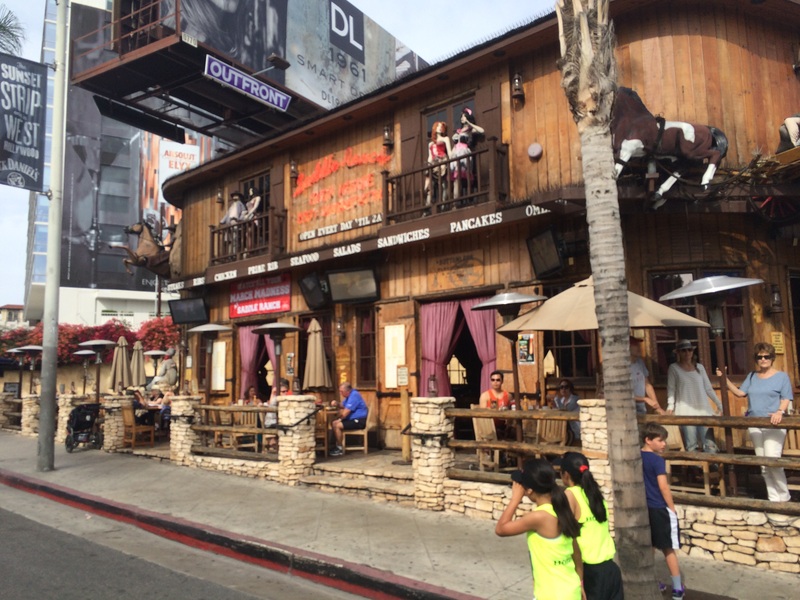 What I didn’t know before running by is that there was a Saddle Ranch on the Sunset Strip. 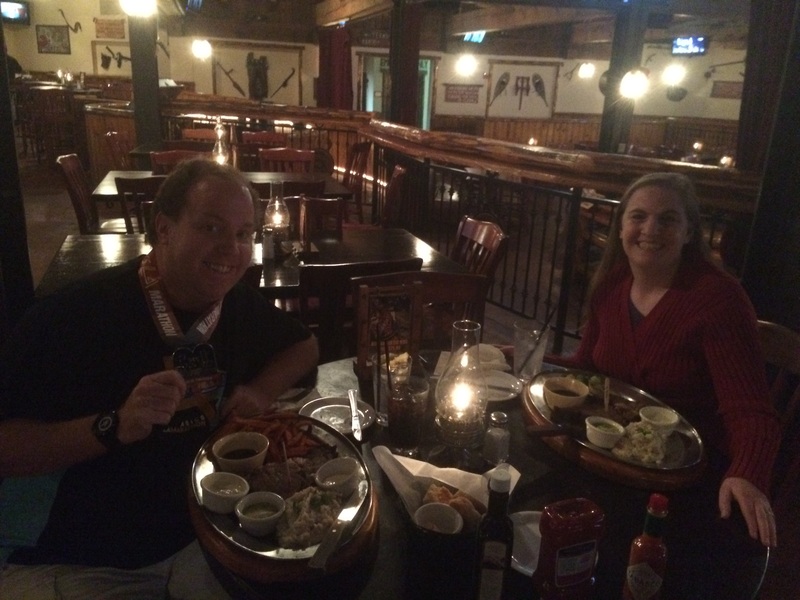 Brooke and I would be dining in the Saddle Ranch at Universal City Walk to celebrate my marathon finish! So, I got a little excited to see another one existed. 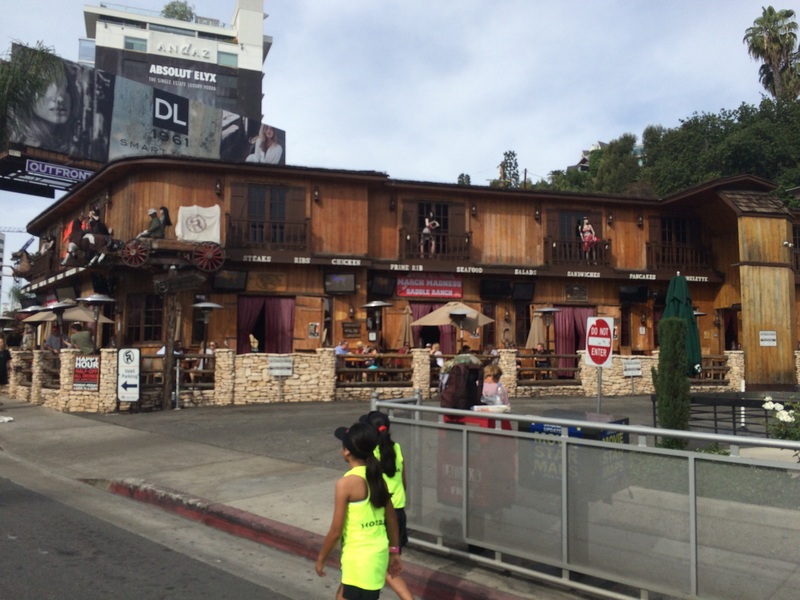 I have no idea why seeing the Saddle Ranch perked me up, but it did. I think the thought of getting to the finish line is what did it! I was just digging all the fun looking buildings and scenery throughout West Hollywood! The Comedy Store! I couldn’t help but wonder how many famous comedians honed their comedy skills at this place. 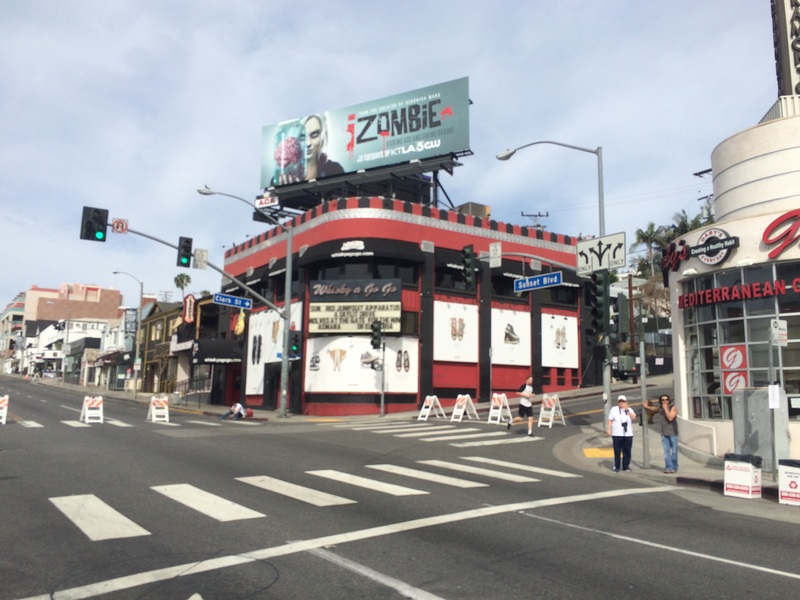 The House of Blues on the Sunset Strip! I was seriously digging all the cool clubs! The picture I took of Mel’s Drive In didn’t come out so well. However, this guitar outside did. There were lots of big billboards to keep me entertained. Up next was the Viper Room. Lots of Rock acts started out playing clubs like this one! 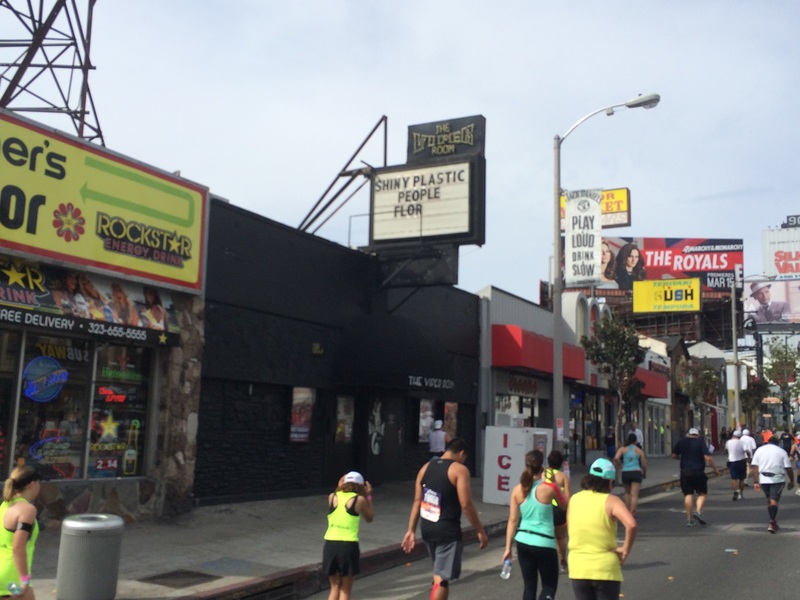 The last music club we passed by was the Whisky a Go Go! 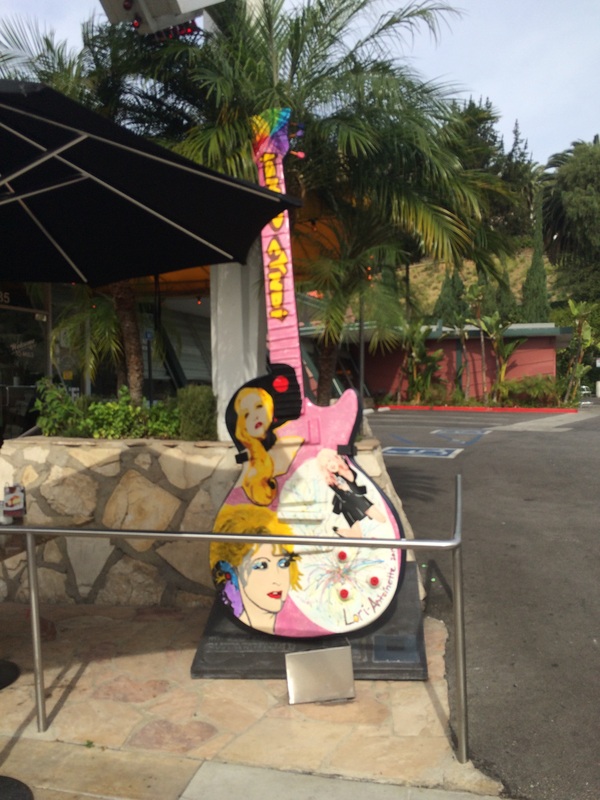 The musician in me was feeling really happy all the way through the Sunset Strip! So much rock n roll history in these clubs. I was feeling it all the way! From the Wisky, we turned away from the Sunset Strip and headed downhill. As I ran downhill, I felt amazing! I was still feeling all that music history and it was driving me. Before I knew it, I saw the sign…. 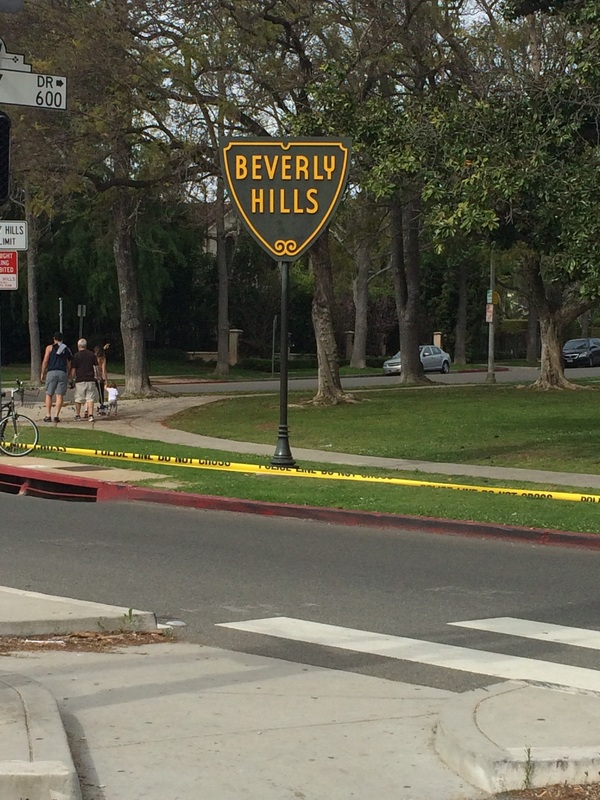 I was about to hit up Beverly Hills! 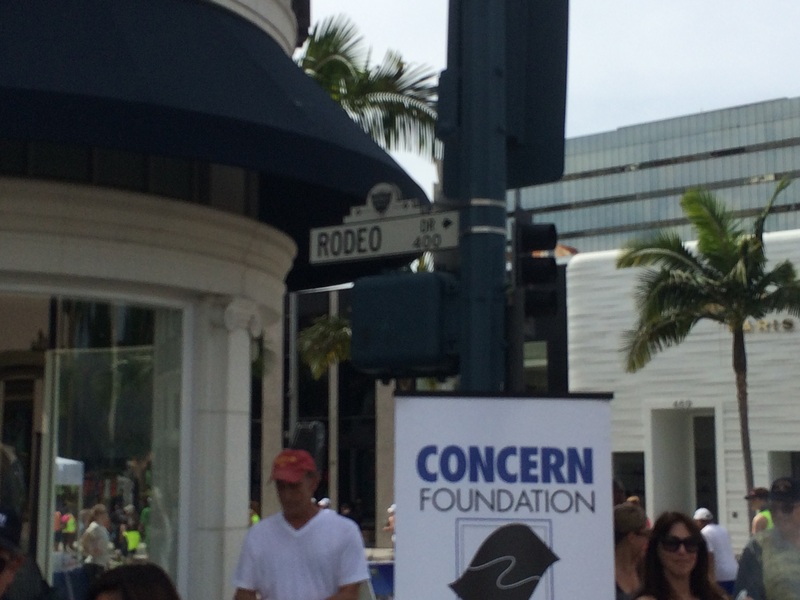 Rodeo Drive was not far away! I loved all the palm trees we saw along the way. 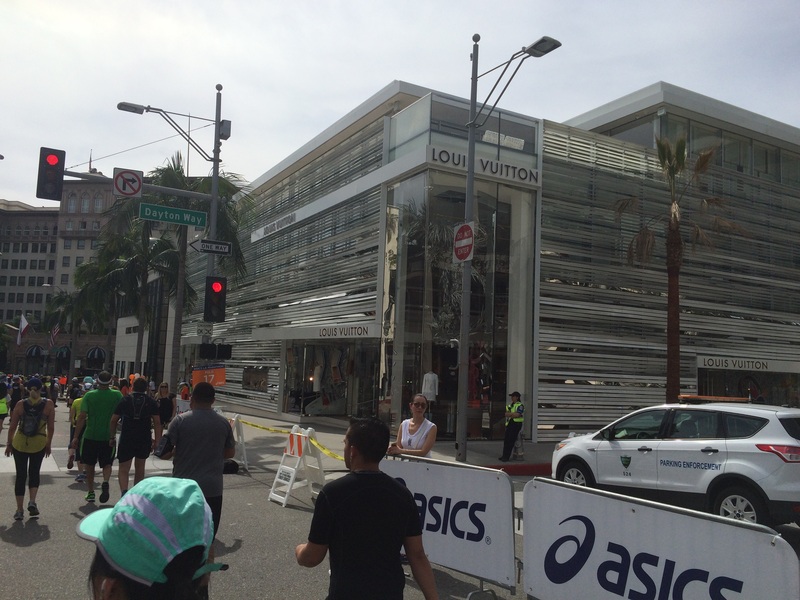 Although, I don’t think they provided as much shade as Deena Kastor thought they would. It was still fun to be in a much wealthier part of town. I couldn’t help but wonder how the crowds would be here. Would they be as supportive and festive? 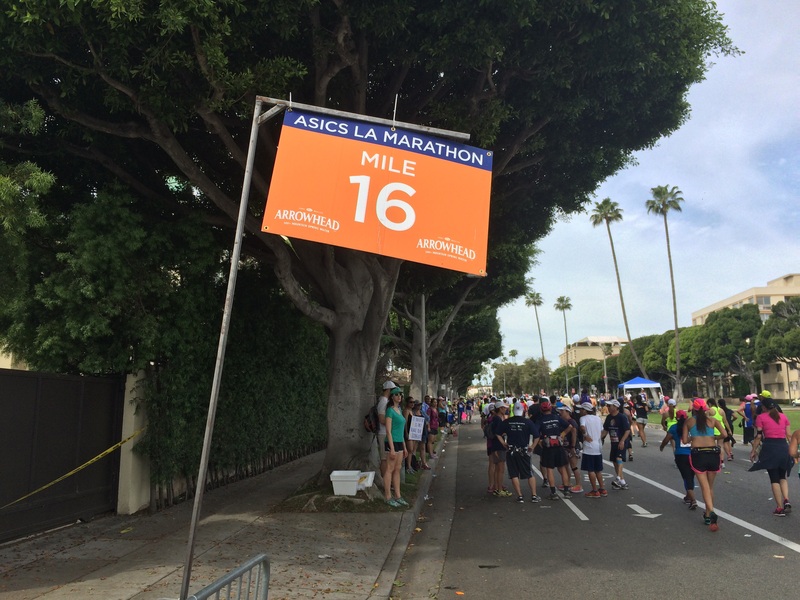 Crossing the 16 mile marker meant that we were getting down to single digits! Hooray! As a first aid station in mile 17, I decided that I had to check out these “cooling buses.” I stopped and asked one of the workers if the buses I saw were indeed cooling buses and they told me yes. So, I asked if I could check them out. Keep in mind, I wasn’t feeling overheated or anything. I just was curious. 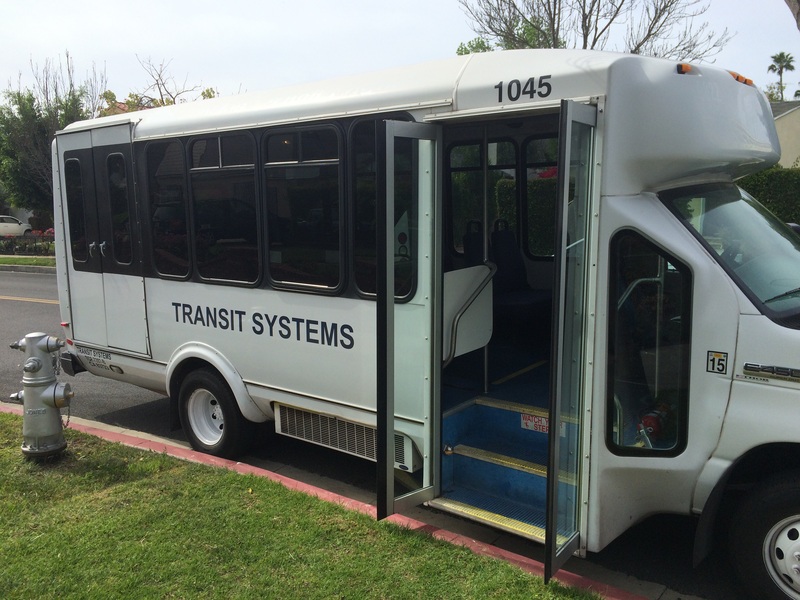 Much to my surprise, the bus was totally empty. So, I hopped on board and sat down for a minute or two. All cooling buses are is buses that have the air conditioning running all the time. So, when you get on board, they are very cold. If you’re overheating, I could see the benefit of hopping on board. 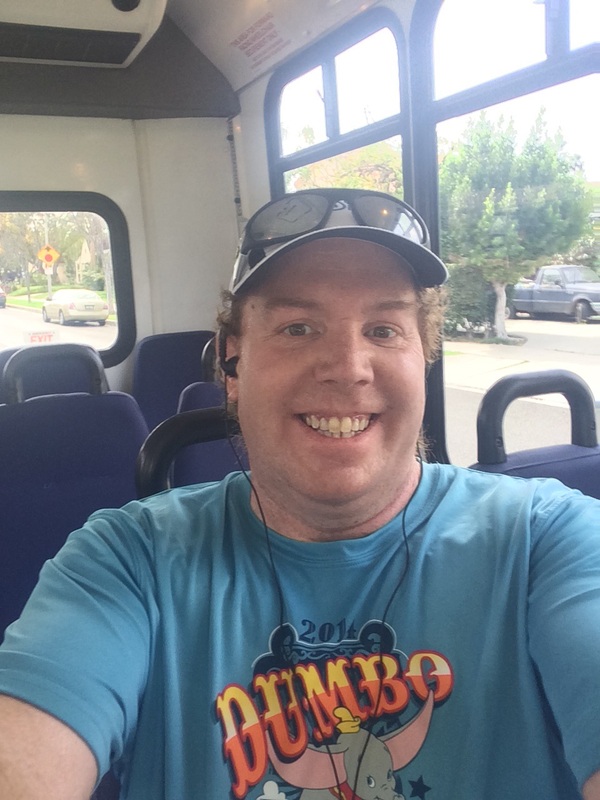 After my journalistic expedition to the cooling bus, it was off to the course and to finish this race! 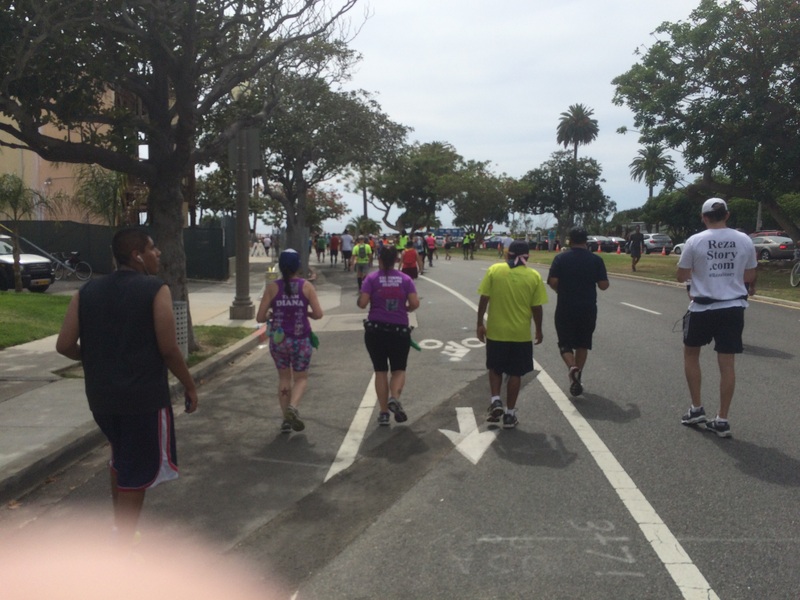 Down Doheny Drive, there was lots of shade! 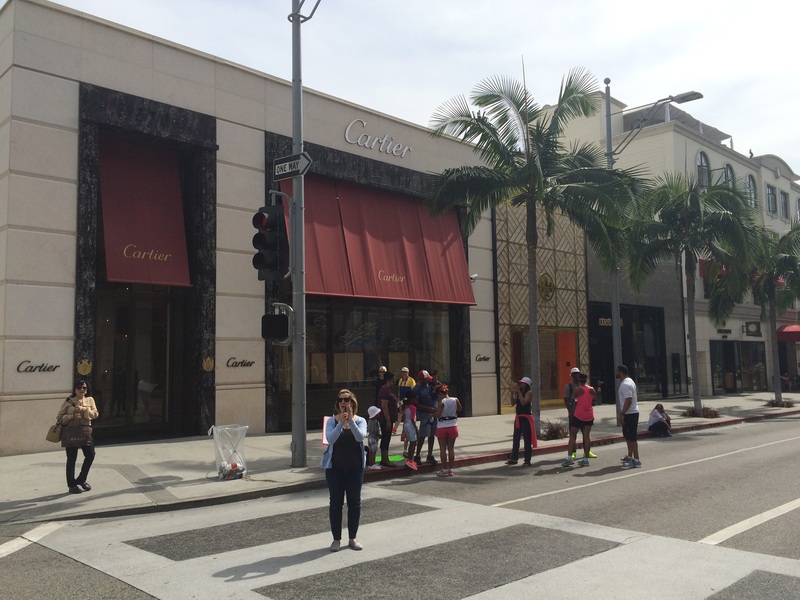 Before I knew it, we were at Rodeo Drive! I got a little excited about this. Time to head down a street that has shops I could never afford to step in. This was the part of the race I was most looking forward to! Can you tell? I don’t know much about fashion and high-end shopping. However, I love Ralph Lauren clothing! Yep, the smile was on my face the entire time down this street! I think Cartier is a pretty high-end kind of shop. Gucci is pretty high-end I think as well! Oh the life I was having this day! 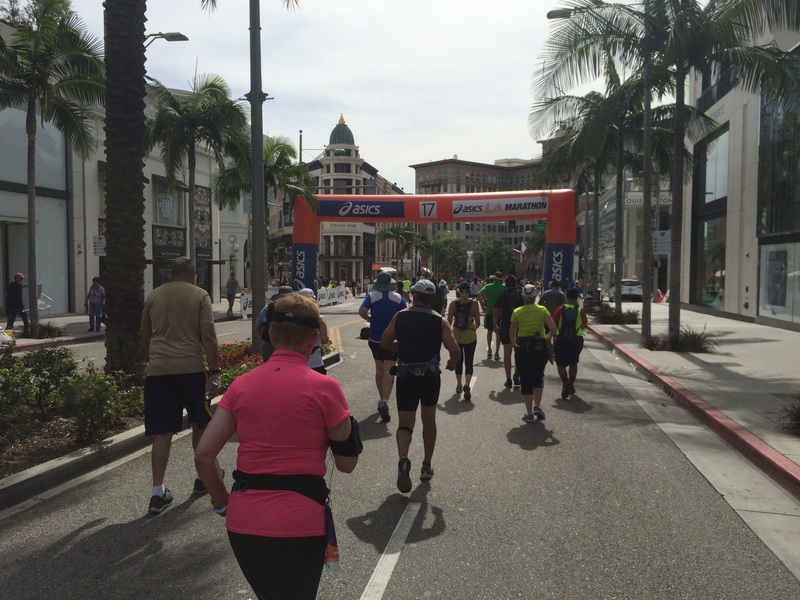 Towards the end of Rodeo Drive was the 17 mile marker! I’ve got to be honest, I have no idea what I was getting a picture of here. It just looked important. Loui Vutton is another store that I think is pretty high-end. My days of watching Beverly Hills, 90210 were helping me out with the stores. And my trip down Rodeo Drive is almost finished! 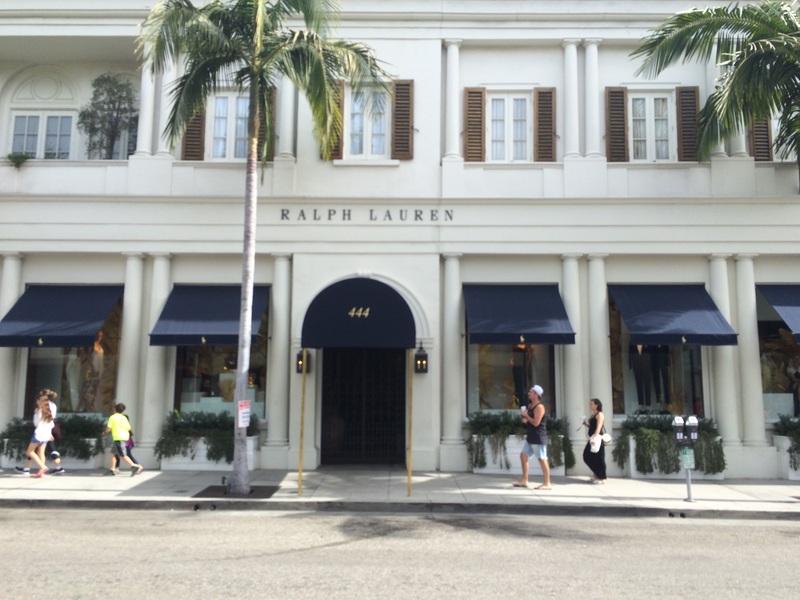 Bye, Bye Rodeo Drive. It was fun! 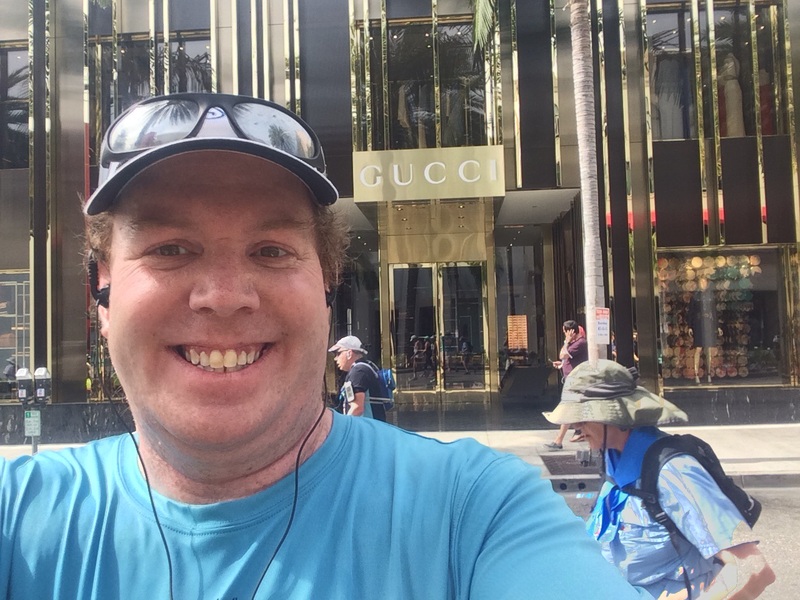 I had so much fun running down Rodeo Drive that I couldn’t help but wonder if I enjoyed this more than running down Main Street USA at Disneyland and/or The Magic Kingdom. What do you think? 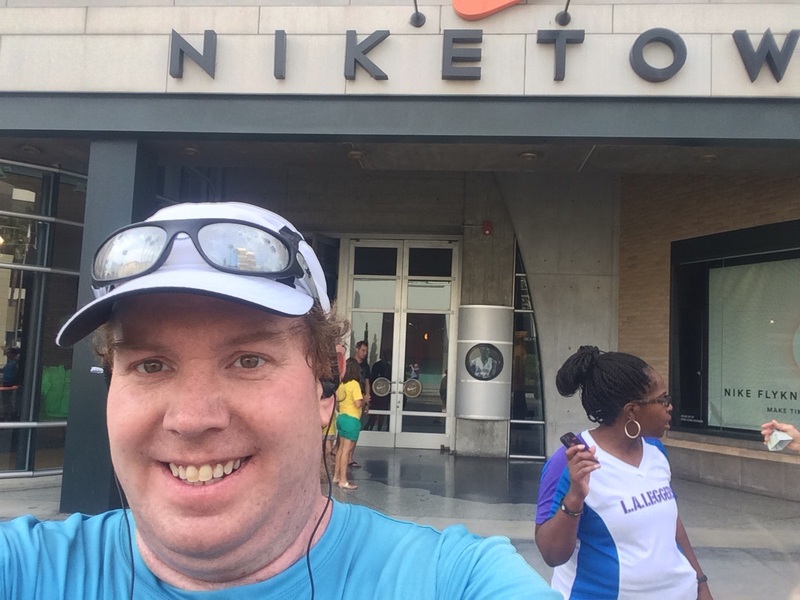 On the way out-of-town, I did have to stop for a picture in front of the Niketown store of Beverly Hills! I mean, I do use the Nike GPS Sportwatch and the Nike Plus App to track my training runs. A little further up the road, we came across this street performer. I wished this picture came out better. Not too far later, I came across my favorite sign on the road! In mile 19, the sun finally showed up on full force. 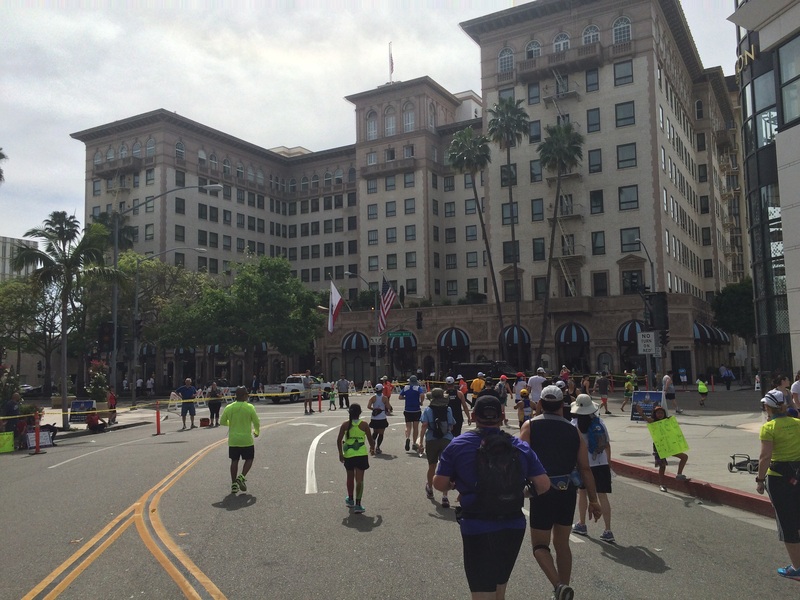 They say that the marathon has two halves…the first 20 miles and the last 10K. I learned the truth of this statement in a big way. I took this picture after I started feeling some tightness in my lower calf and had to cut a run interval short. Because the temperature was getting much hotter, I started worrying about the effects heat can have. I did try a few more run intervals to get me to the end of 19 miles. However, I had reached the point, by the 20th mile, where I was needing two cups of water and/or Gatorade at each water stop. By the start of mile 20, I decided I’d walk it out until the end of the 23rd mile. I knew the course well enough to know that, by the end of mile 23 it was all downhill to the finish. Also, we’d be on San Vicente Blvd heading towards the beach and cooler temps. It seemed like a good plan. When we passed by this Mormon Tabernacle, I was sort of hoping it was the VA. Needless to say, I was a little sad to see that it was not. 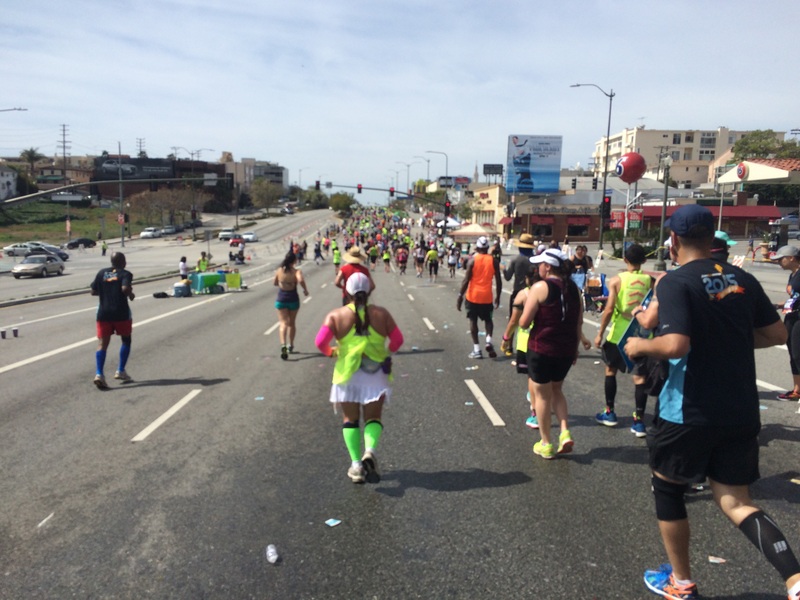 Miles 19 and 20 were pretty boring to me and really hot. 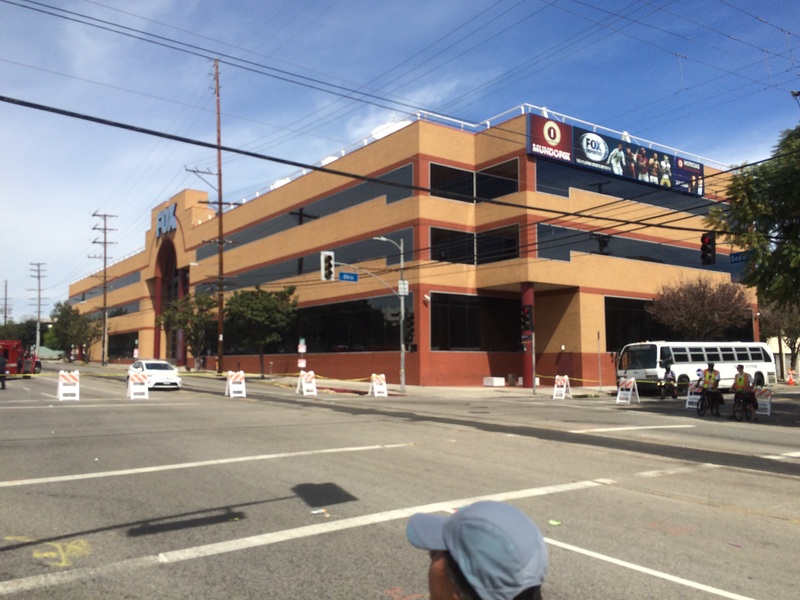 I was thrilled to see the Fox Studios! Finally, something cool! 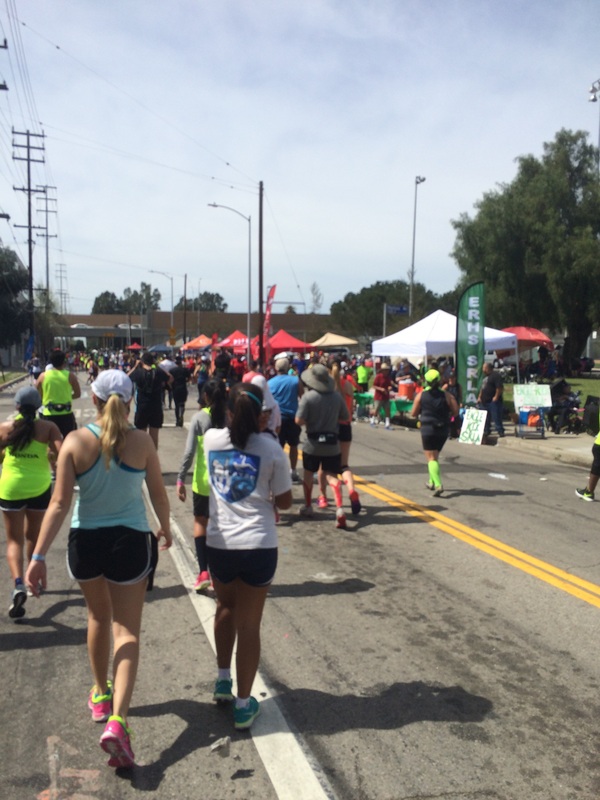 As we turned onto another street, we were met with a lot of crowd support and lots of tents from the various running groups at the race. There is a definite advantage to being with one of those run clubs. 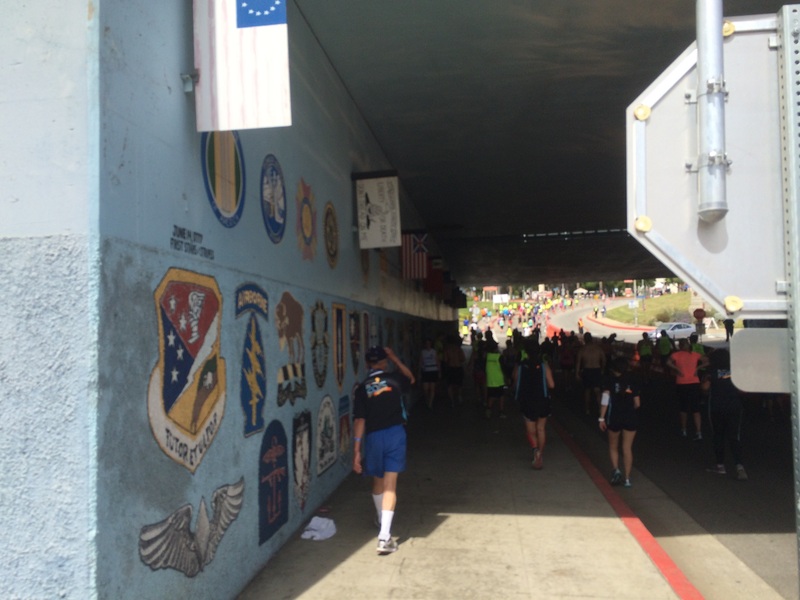 When I saw the freeway overpass, I knew for sure that the VA was getting close! This time, I was correct. Here we are turning into the VA! I really liked that there were American flags lining the street as we passed by. As you can see, though, there was very little crowd support for a majority of our time here. The roads in the VA section were not the best. So, many people were hopping up on the sidewalks. Passing through this overpass was something I looked forward to. After all, there were more than a few bloggers who had pics from this area. I loved it because we finally got some much-needed shade. 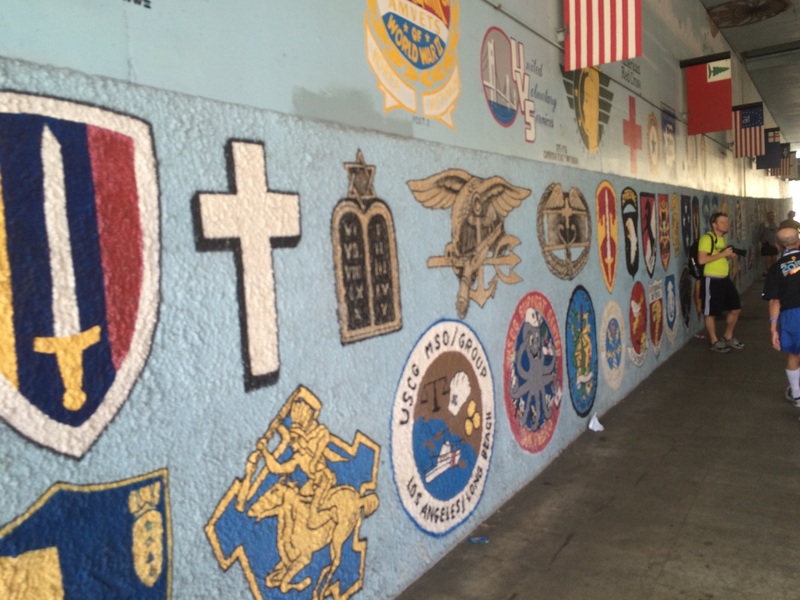 Loved the insignia that lined the walls! Coming out of the shade, we climbed the last hill of the race. This photo, by marathonfoto, perfectly captures how I felt. 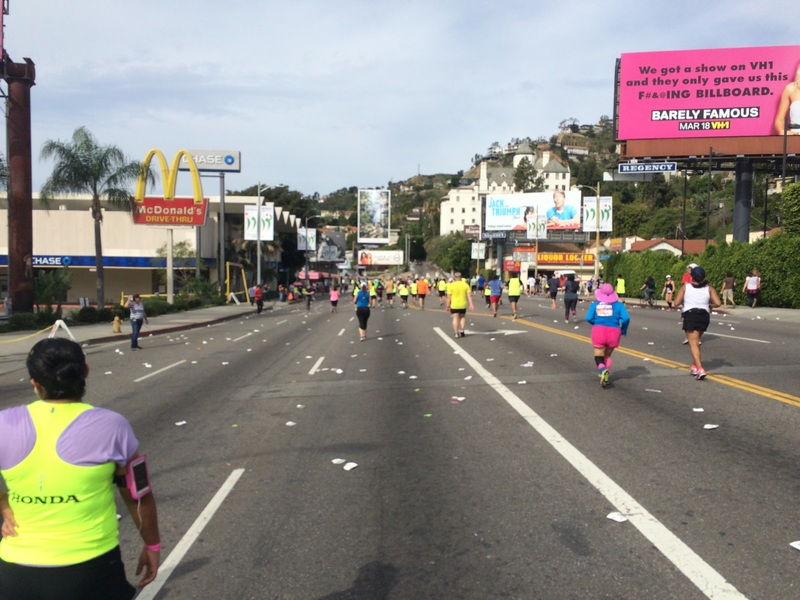 Many of us were not too happy to see this hill in mile 22. It was hot and I was tired. There was no way I was going to run up the hill now. This is the main administration building at the VA. I thought it was cool. So, I took the pic. Anything to keep my mind distracted. 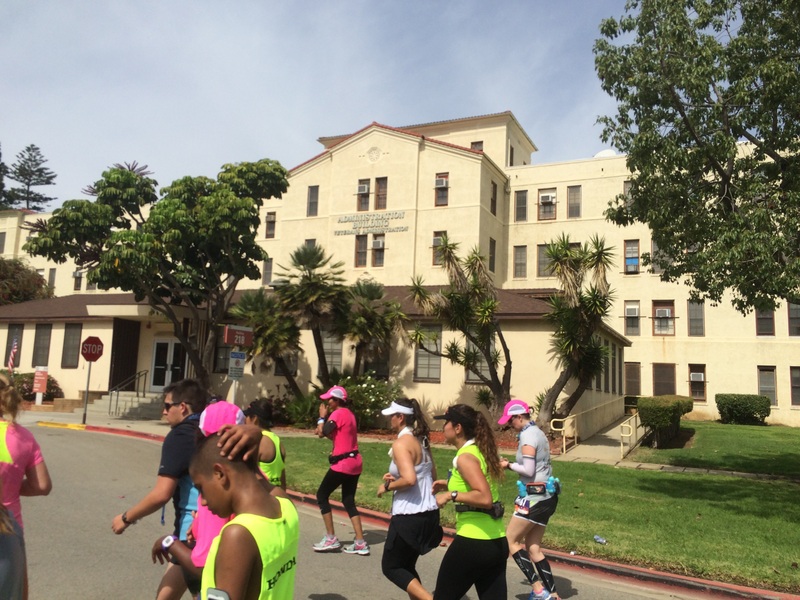 As we came out of the VA, we got onto San Vicente Blvd….only one more street to run on until we finish! 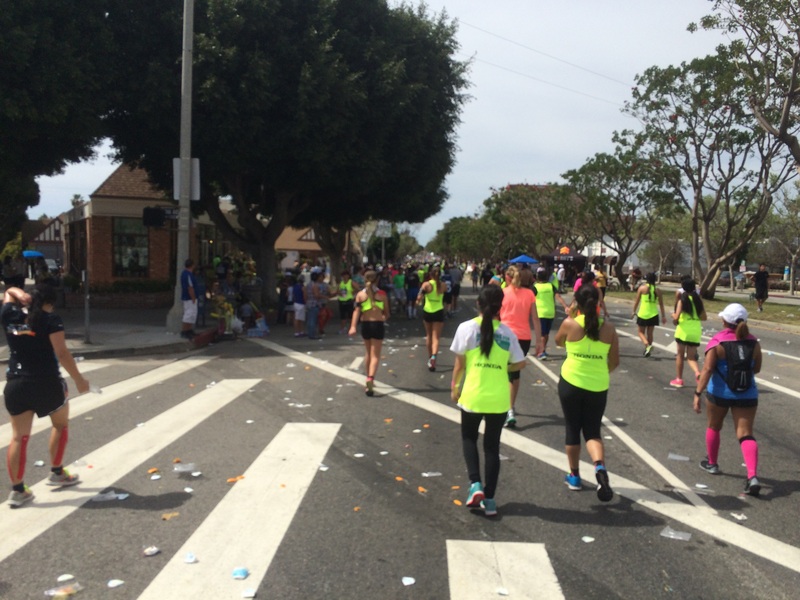 As I had mentioned before, the LA Marathon organizers put out word to the spectators to bring out food and water to help us runners out. Mostly, it was water, bananas, oranges, and pretzels. However, at this spot (I believe in the 23rd mile), they had “Cold” pizza! There were people handing it out to us runners. Oddly, it wasn’t appetizing at the time. 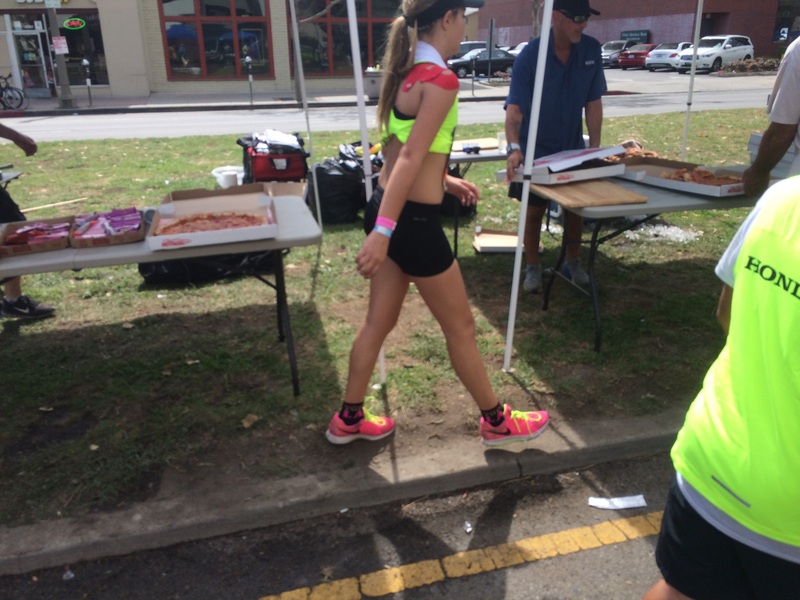 However, other runners looked at each other and said…”Why not?” It wasn’t until I got to the tent that I saw the “Cold” Pizza sign to see that it was cold pizza. Too funny. 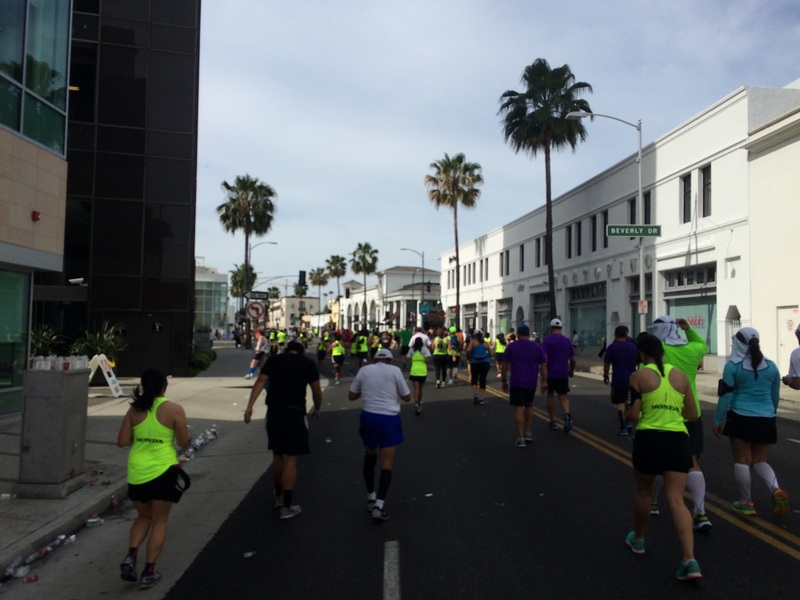 By the end of mile 23, my feet were hurting and I was wishing I could get more water. Don’t get me wrong, there were water/Gatorade stops somewhere in each and every mile from the 2nd mile all the way to the last mile. It’s just I wasn’t feeling like it was enough. I’d take a couple of cups of water. Drink one and start to drink the other. However I also wanted to dump some of it on my head. So, that last cup lasted a while as I tried to decide…to drink the whole thing or split it up. One thing I’d like to mention about the picture above…by the time we got here, I came across a bank. Some banks have this sign which goes back and forth between displaying the time of day and the temperature. When the temperature came up, the sign said “87” and I thought to myself “awesome!” Yes, folks, it was 87 degrees out and I still had more than 3 miles to go. Yikes! I tried a few run intervals. However, my mouth was so dry. So, instead of going back to the run/walk intervals at the end of mile 23, like I planned. I decided to just walk it out until the last mile. The new plan was to start back up at mile 25. 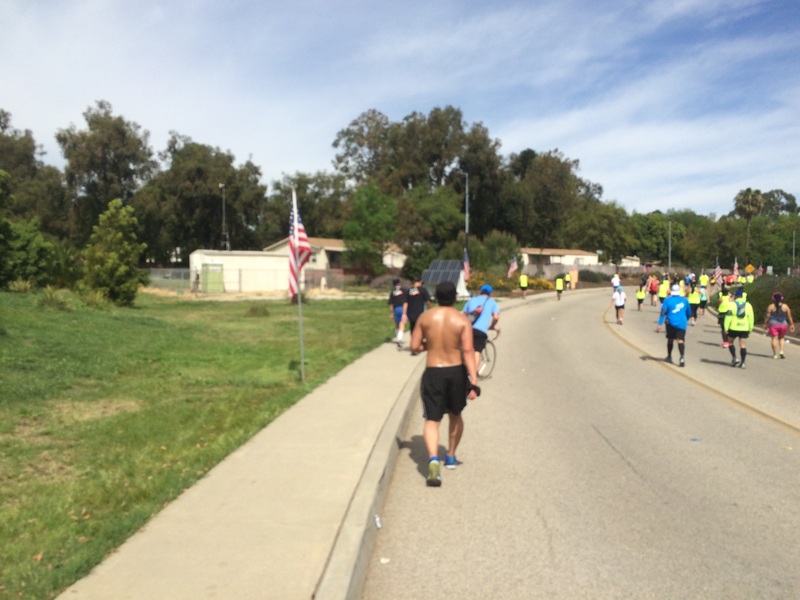 Shortly after the 23 mile marker, one of the spectators was pointing out a fire truck to us. She said that the rest of the race would be downhill! I tried to go again once I got past that truck. However, I got concerned by the fact I needed more water. Thankfully, in the 25th mile, a lady on the side of the road was handing out cold bottles of water. I took it. That water was heavenly! I didn’t drink the entire thing because I didn’t think we’d get a water stop in the 26th mile. So, I wanted the extra water just in case. 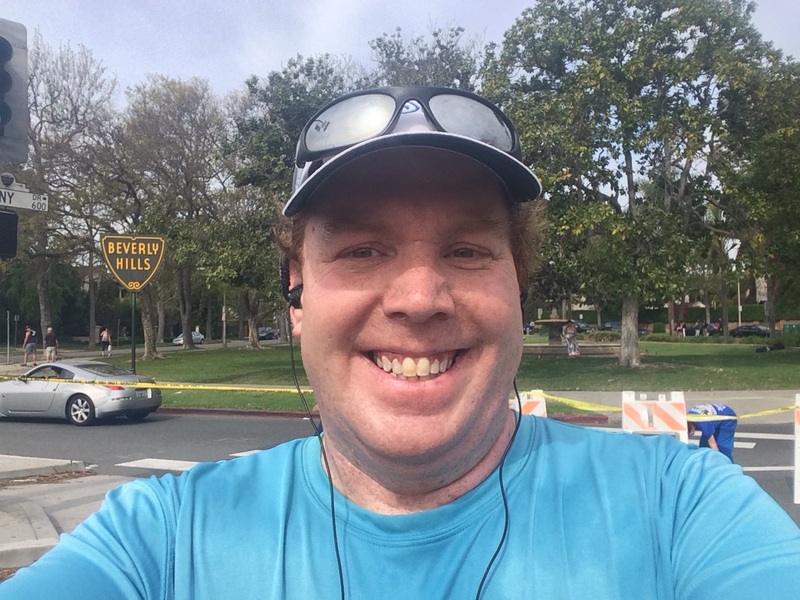 As I approached the 25 mile marker, I was getting ready to try running again. My first step at the mile 25 mile marker, I felt something pop on my foot. Blister popped. I didn’t even know it was there. I mean, my feet were sore. But, I didn’t know I had a blister. However, with that first step, I felt like my time running was over until the very last stretch of the race. As we turned onto Ocean Blvd., I had a mixture of emotions going on. 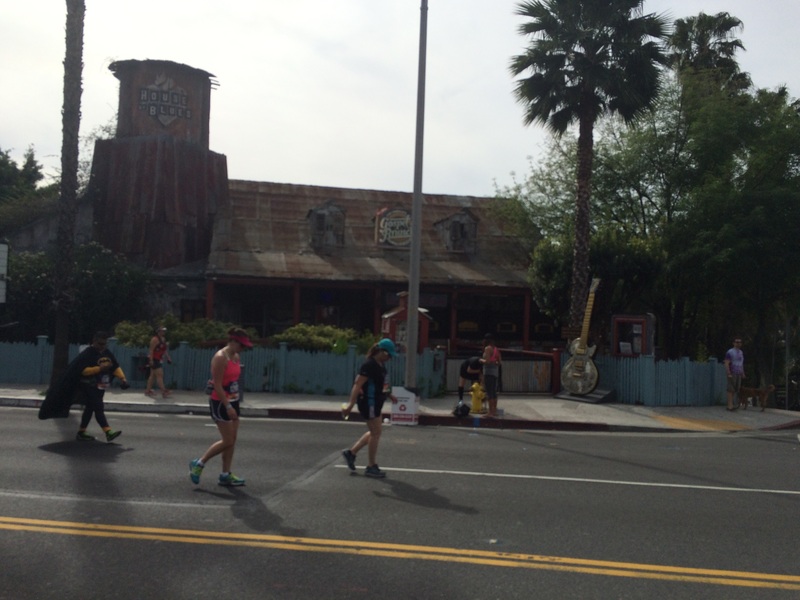 I knew that I was going to finish my second full marathon and was going to get to finish in the real finishers area. After all the misery I was feeling over that last 10K, I was going to do that! However, I could feel that part of my foot where the blister popped every time I stepped on that foot. 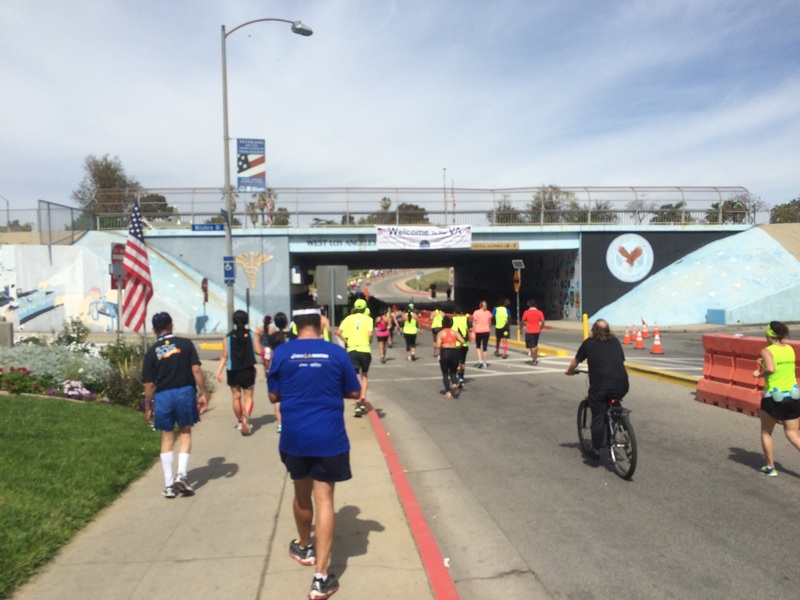 I was disappointed that I wasn’t finishing this race with my planned run/walk intervals. 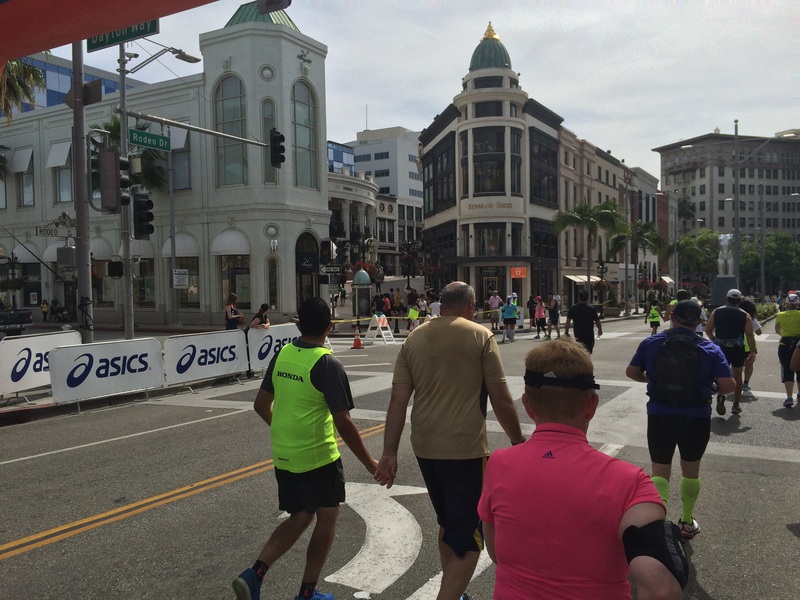 I was bummed to be walking as I watched so many others running their way to the finish. That should have been me. But it wasn’t. So, there was this mixture of happiness and sadness as I made my way onto Ocean Blvd. for the final stretch. Seeing the finish line in the distance was a wonderful sight. Even though I was walking, they weren’t closing off the real finish line! So, I would get to cross the same finish line as the winners of the race! That was my victory! One thing that surprised me about this final stretch is that there was one last water stop about a half mile from the finish line. 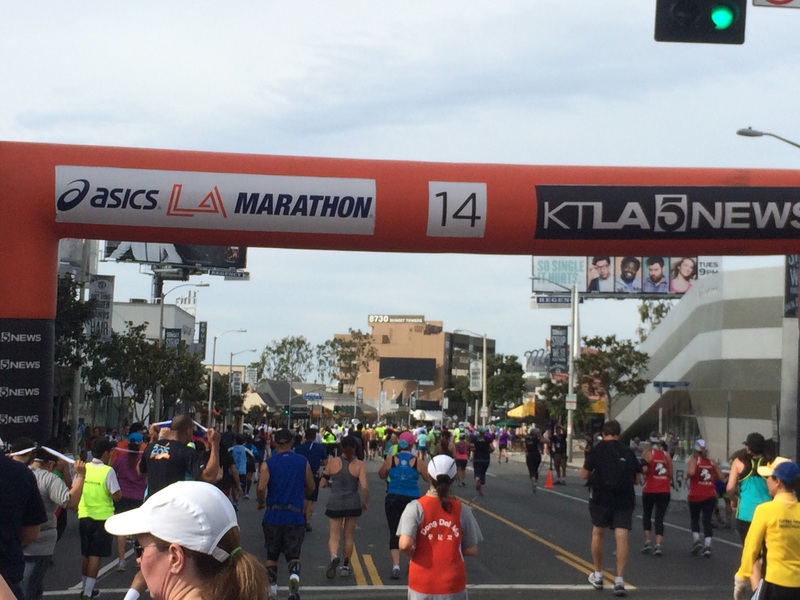 Way to go LA Marathon! 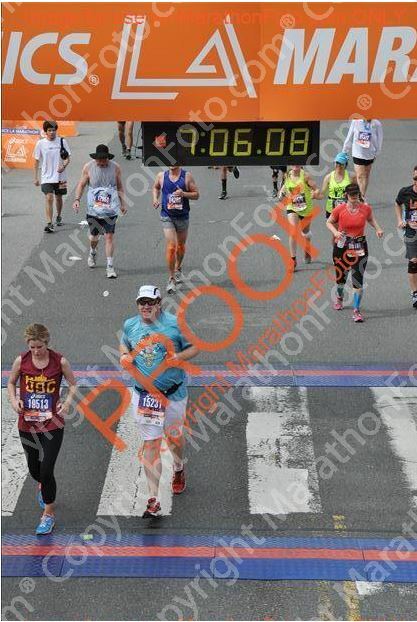 I ran a little bit to get a closer picture of the finish line! After taking this picture, I ran the rest of the way. It didn’t matter that the outside of my foot hurt. 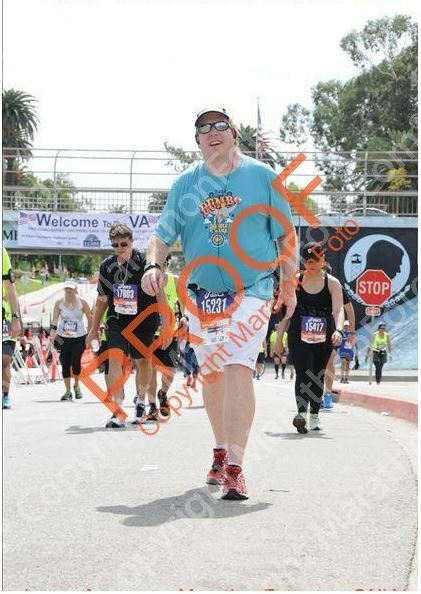 I wanted to run across the finish line. So, after snapping this picture, I ran the rest of the way! Finished! Okay, one step from finishing in the photo. However, it’s close enough! At the finish area, they had these amazing misting fans! They were heaven on earth! When I arrived at the fans, the lady that was next to me told me that she had been there for 10 minutes already and didn’t want to leave. After stepping into the cool mist, I couldn’t blame her. It’s like these machines breathed life back into me! Isn’t the finishers medal cool? I absolutely love this medal! 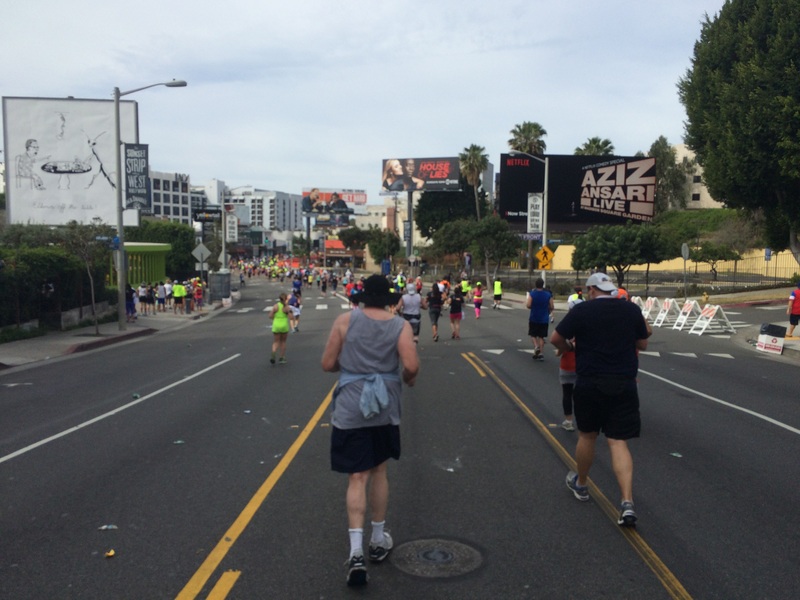 I’ve got to say this….the tiredness and hurting feet didn’t matter one bit once I started running to the finish. 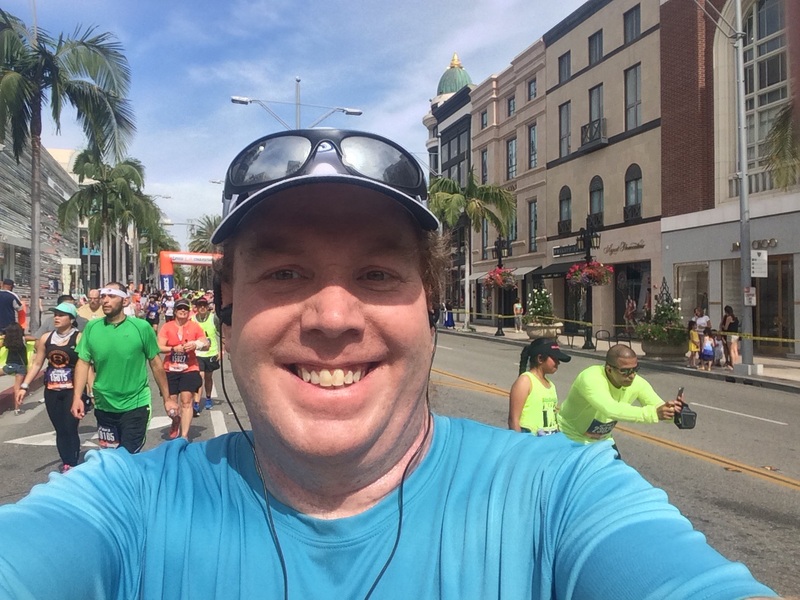 Could I have shaved a little time off my finish by running more in the last mile? Maybe. 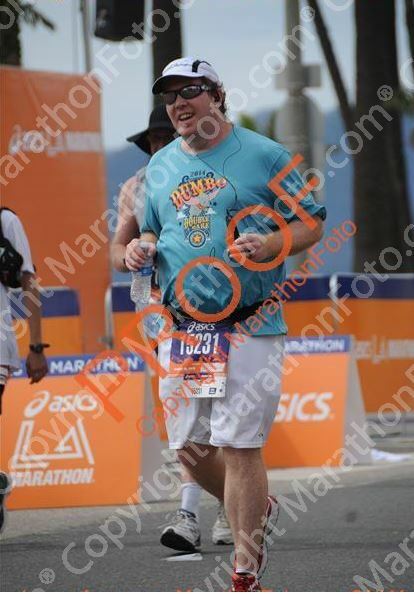 However, at the end of the day, my goal was to finish my second full marathon and live to tell the tale. I really wanted to finish in the same finish line as the people who won the race and I got to do that. It might seem strange to hear that. 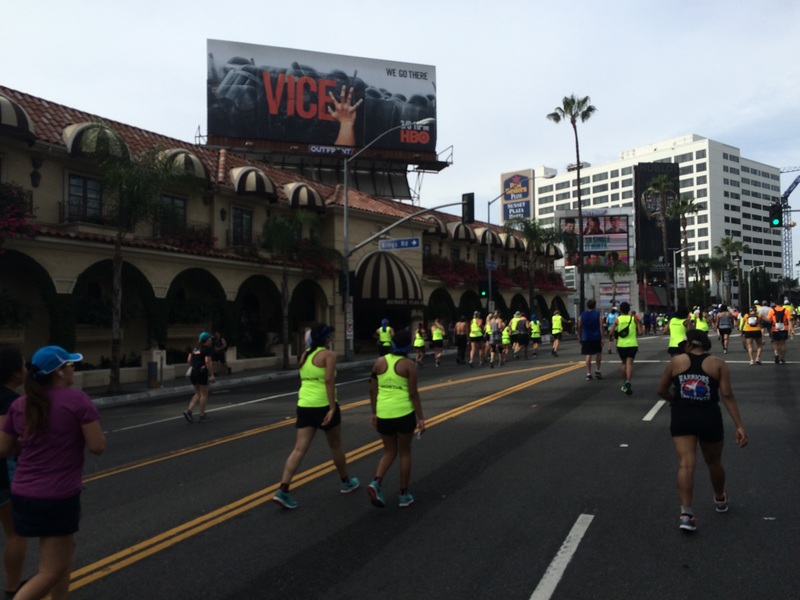 The LA Marathon organization made no mention of a sweeping van like other races I’ve done. They did say that if you didn’t finish within a certain time, they would move the runners who wished to continue onto the sidewalks. You’ could still finish the race. However, the roads would be open to the public and you’d have to obey the traffic lights. 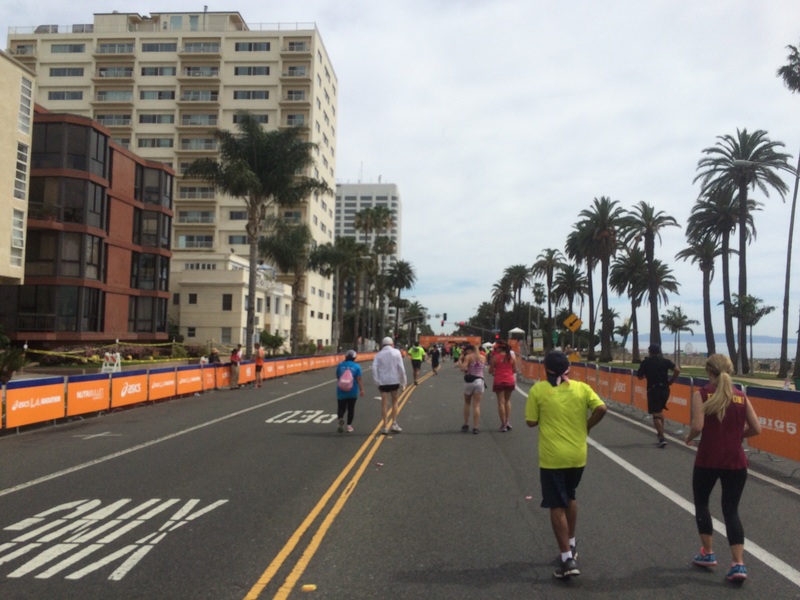 They had a separate finish area that they’d have set up on Ocean Blvd for those folks. I didn’t want to be one of them. So, when I saw that I was going to get to finish in the official area, I almost cried. That meant so much to me! 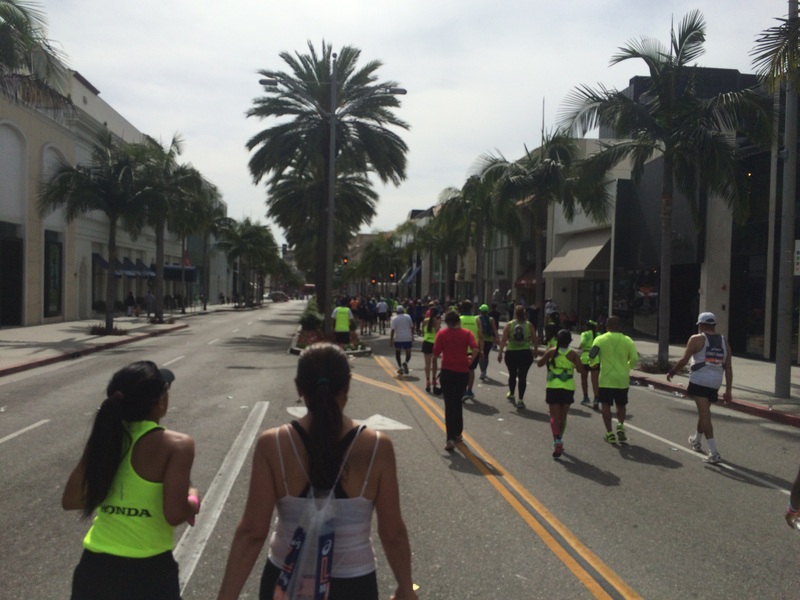 The story of the race may have ended on Ocean Blvd. 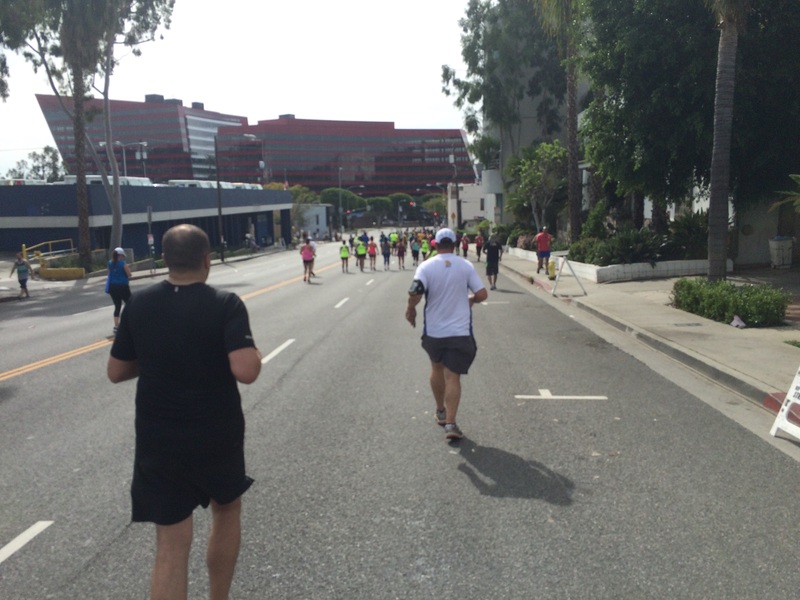 However, my LA Marathon story continued. I slowly walked back to my car after cooling off. I was so grateful that I didn’t park in the lot that I paid to park in initially because I’d have to walk even further. Once I got in the car, I made sure to text my wife to let her know I was done. Then, it was time to head home. Boy was that an adventure. With all the street closures that were in effect, it took me over a half hour just to get back to the freeway. Then, I was greeted by bumper to bumper traffic for almost the entire trip home. It was nearly 90 degrees outside, the A/C in my car decided to stop working before I got on the freeway and it took me 2 and a half hours to get home. Let me put this in perspective. When I drove to Santa Monica in the early morning, it took me 30 minutes. Getting home took me 2.5 hours! I was miserable. I was tired, it was hot and I was barely driving. So not fun. I did make it home, though. I took a cold bath for my sore legs for a while. Then got cleaned up and took a 45 minute nap! My youngest niece was in town from Houston. So, Brooke was hanging with her. Brooke got home just as I was getting up after my nap. It was perfect timing. 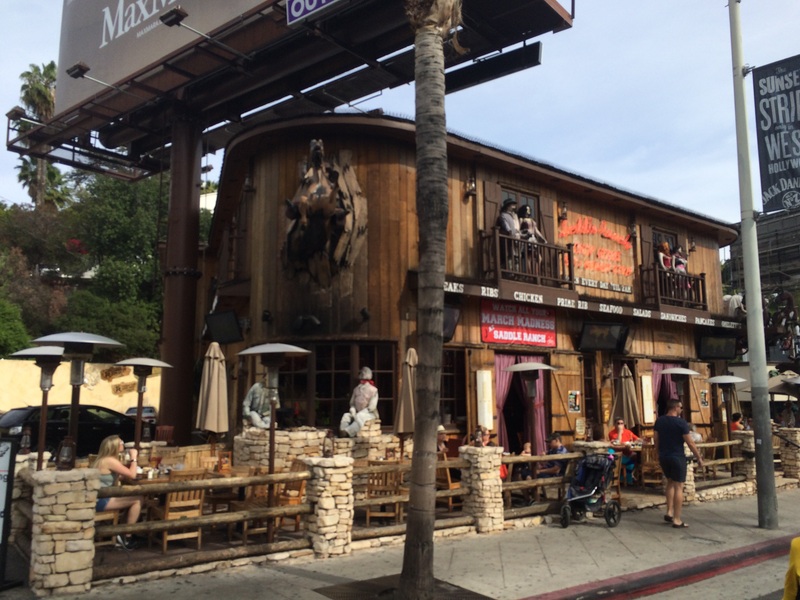 We headed off to Universal City Walk for my celebratory meal at the Saddle Ranch. I was sooooooo hungry by the time we arrived. After all, this would be my only real meal of the entire day. I finished the marathon around 2pm. Then, I didn’t get home until around 4:30pm. So, all I had for lunch was the crustable I brought with me. If I had known how long it was going to take to get home, I would have eaten in Santa Monica before leaving. Oh well. This prime rib dinner was much deserved! Needless to say, I was one happy camper to have such a wonderful meal! By the time we got done eating, it was around 9pm. So, we made our way back to the car to head home. Universal Studios has amazing views of the city. 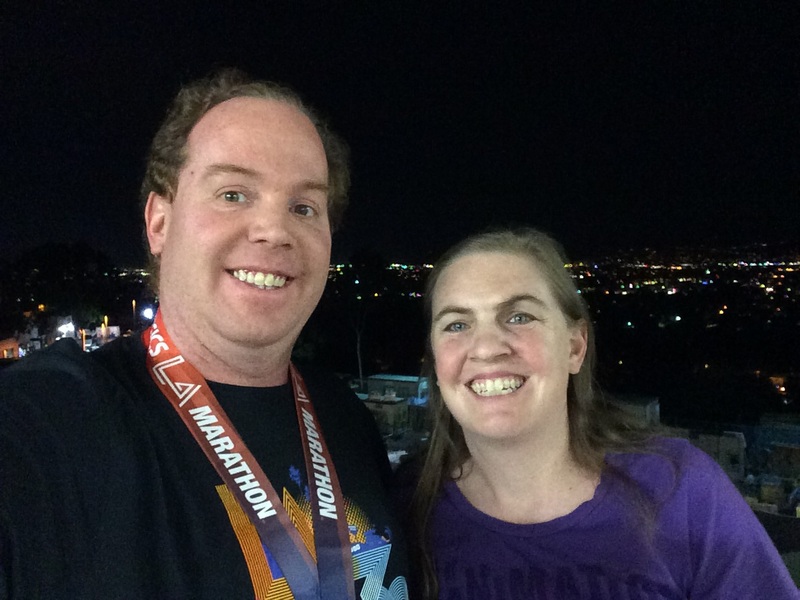 So, we had to pose for one last picture on LA Marathon day! What an amazing day! I am now proud to say that I am a 2 time marathon finisher! 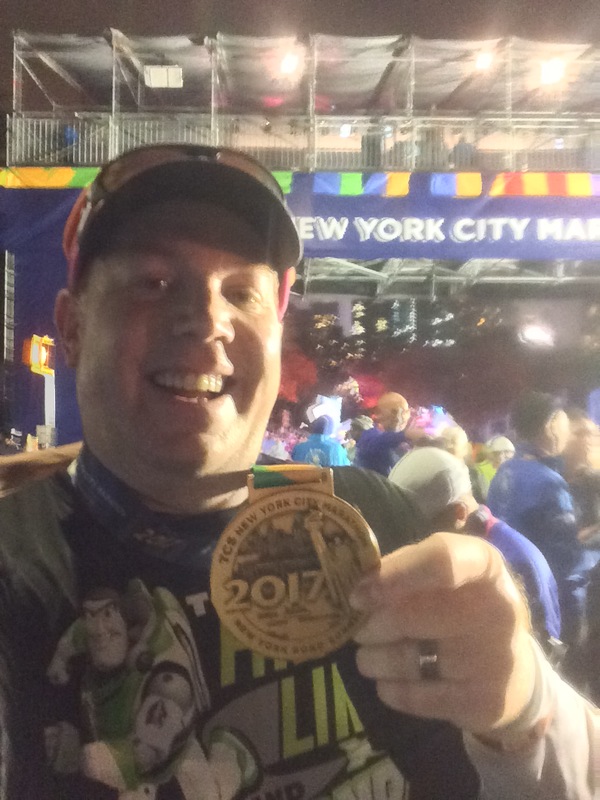 My finish time was slower than the Walt Disney World Marathon. However, who cares? 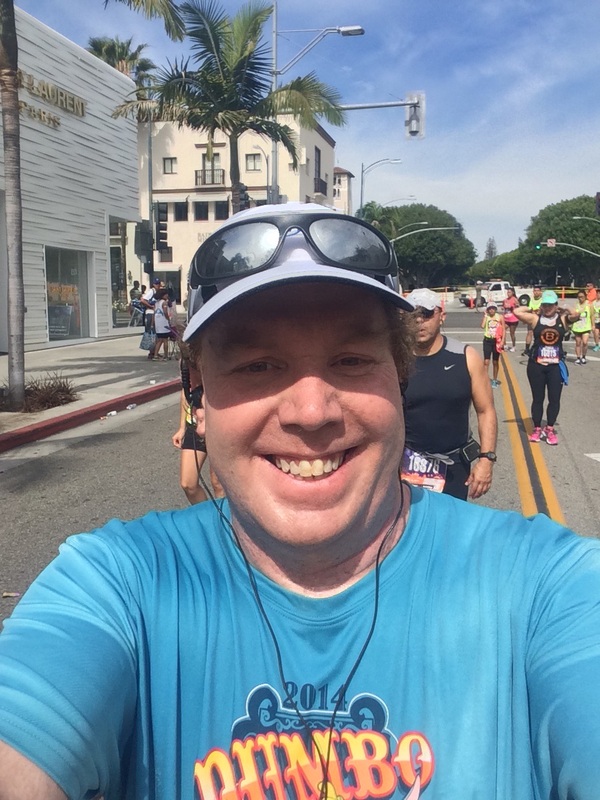 I survived the hottest Los Angeles Marathon of the 30 that have been run! 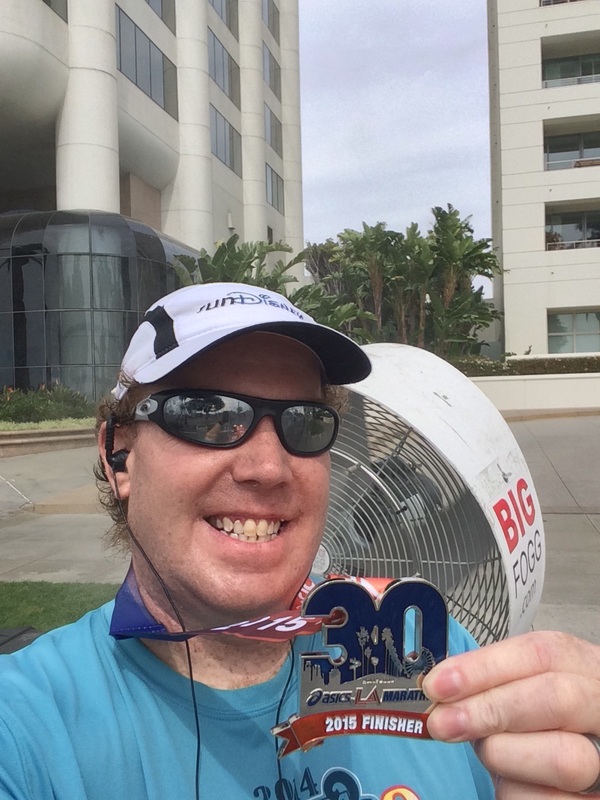 I had tons of fun over the first 20 miles and hung on to the finish! Over those last miles, I did wonder how it would have gone if the weather was a little cooler. There is really no way of knowing. 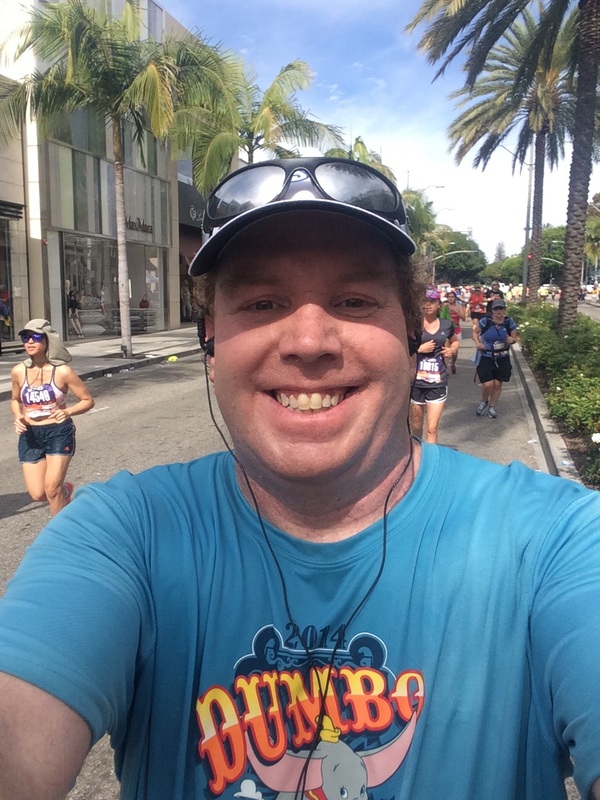 However, it does motivate me to say that I’ll be back in 2016 to run the LA Marathon again. I loved the course overall. The crowd support was amazing! There were so many people cheering us on. At times the support was overwhelming. Now that I know the course, I’ll know what to prepare for next year. 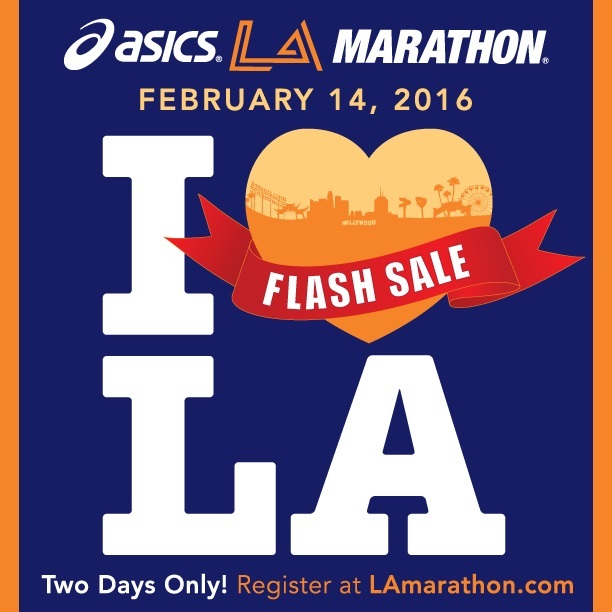 So, come Valentine’s Day 2016, I’ll start the day running the 31st LA Marathon! I didn’t get to take advantage of the flash sale. However, I will be registering in September! 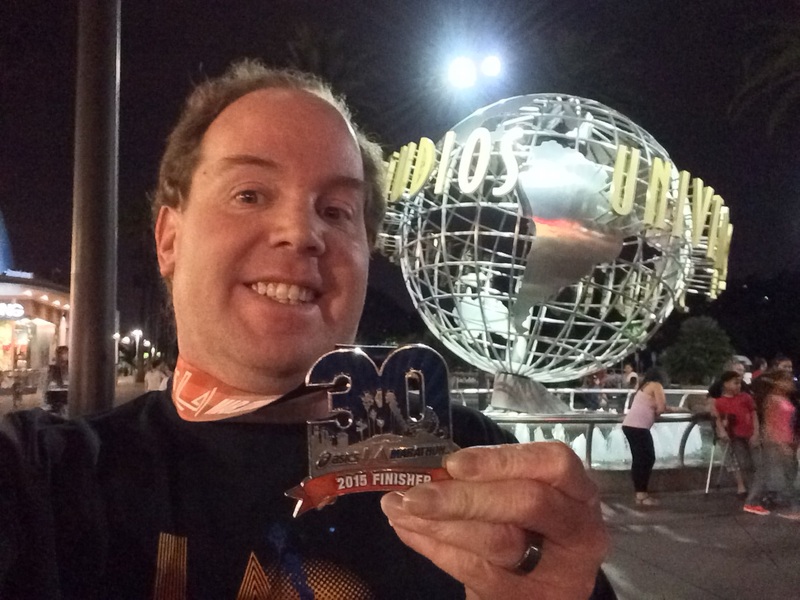 By the way, the celebration of my marathon finish didn’t end at Universal City Walk. 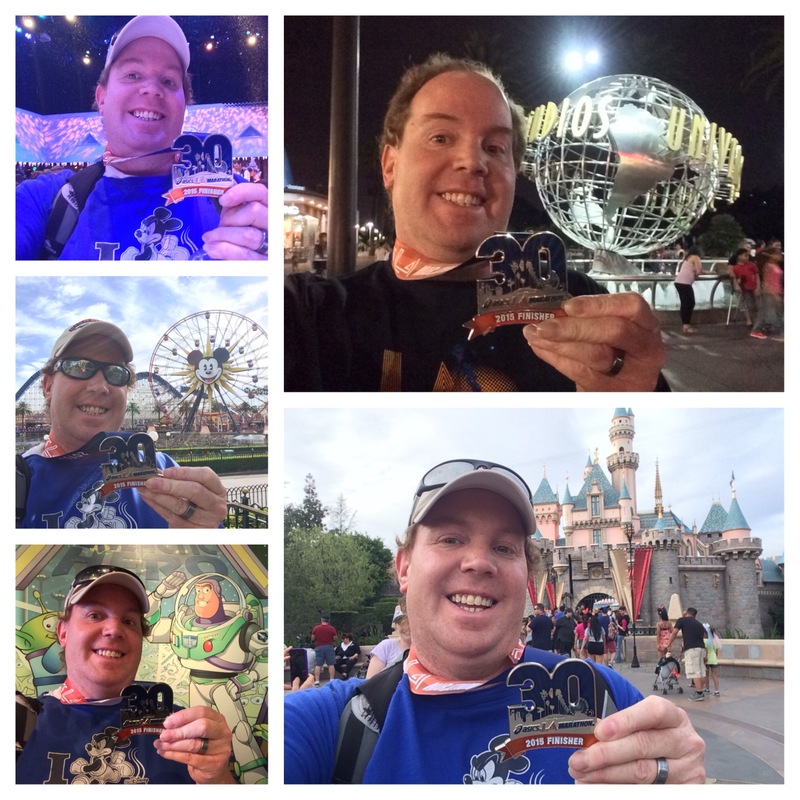 Come back tomorrow and hear about the day after the marathon celebration all over the Disneyland Resort! 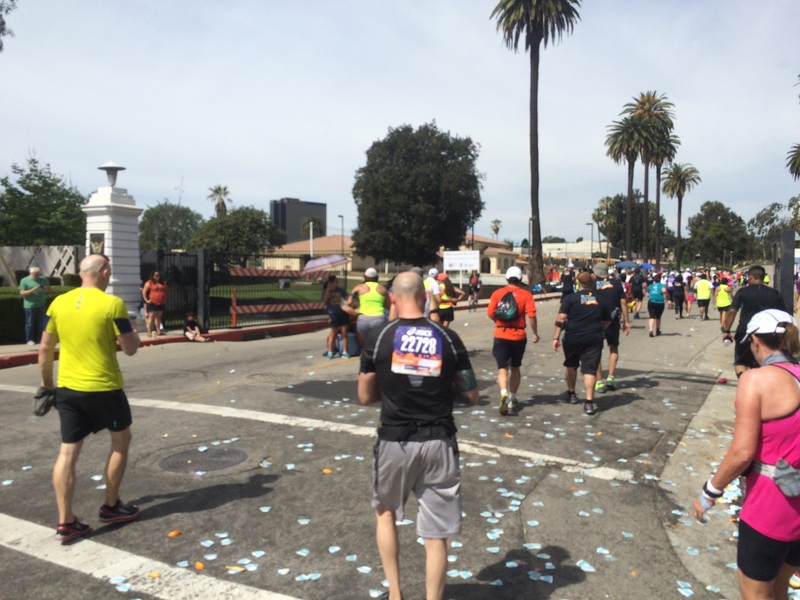 You’ve Just Finished the 30th LA Marathon! What are You Going to do Next? I’m Going to Disneyland! Thanks! I think I teared up a couple times in the last few miles as I realized what I was about to accomplish. 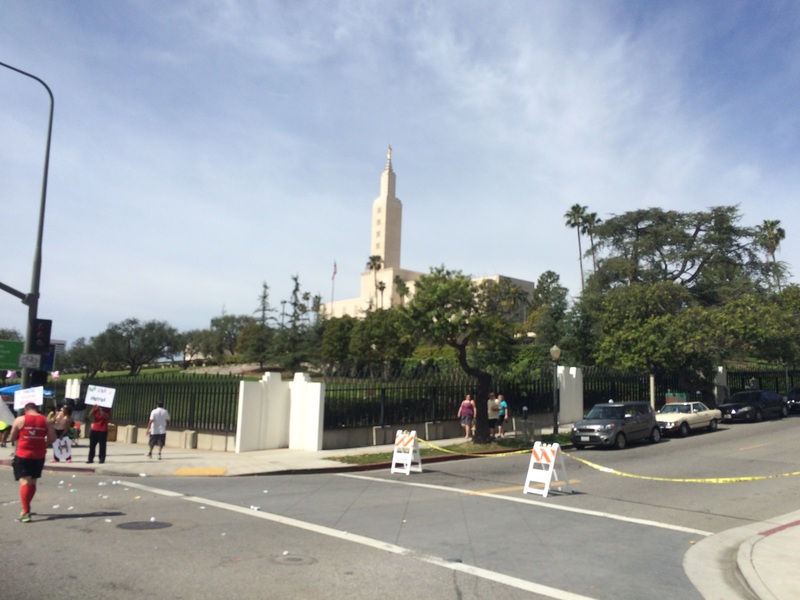 As I made my way up Ocean Blvd., it was a special time. I’ll never forget this race! Congratulations again! It is such an accomplishment and a dream come true from what you’ve said. Yay you! Thanks! I think I’m starting to dream of marathons in my future. Although, this one will rank pretty high on my list. Congrats on finishing! Pretty much everyone I know had the same issue-mile 20 with no shade was too much! and that traffic is out of control!! We went to eat and it took us forever to get to the restaurant. Ive pretty much decided next year since my boyfriend and I are both running that we will be getting a hotel in Santa monica so no one has to drive! Yeah, I could see it in all the runners around me during the 20th mile. I ignored Deena Kastor’s advice to stay away from the fire hydrants. However, they were amazing! I think that’s what gave me the blisters. Oh well. At least we finished and lived to tell the tale! Next year, I might stay at a hotel in Santa Monica as well. 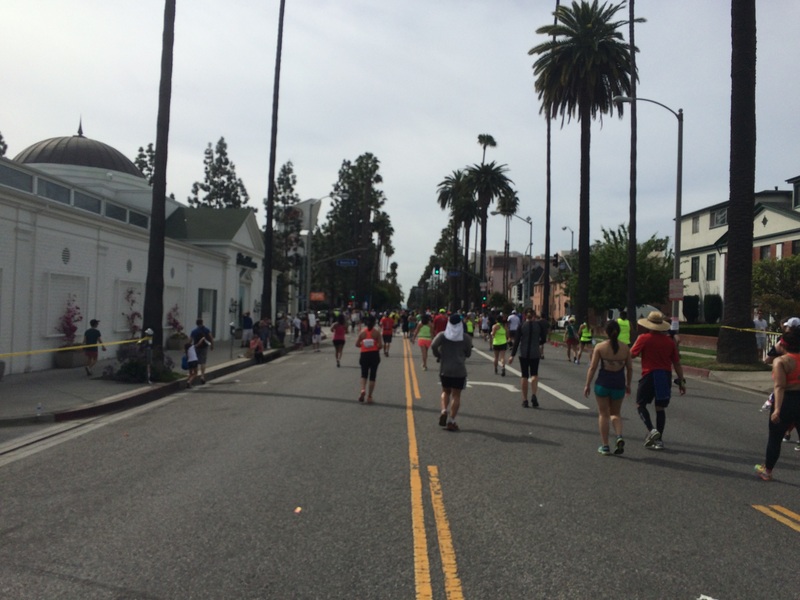 The traffic was too much to deal with after run/walking my way through 26.2 miles in that crazy heat. 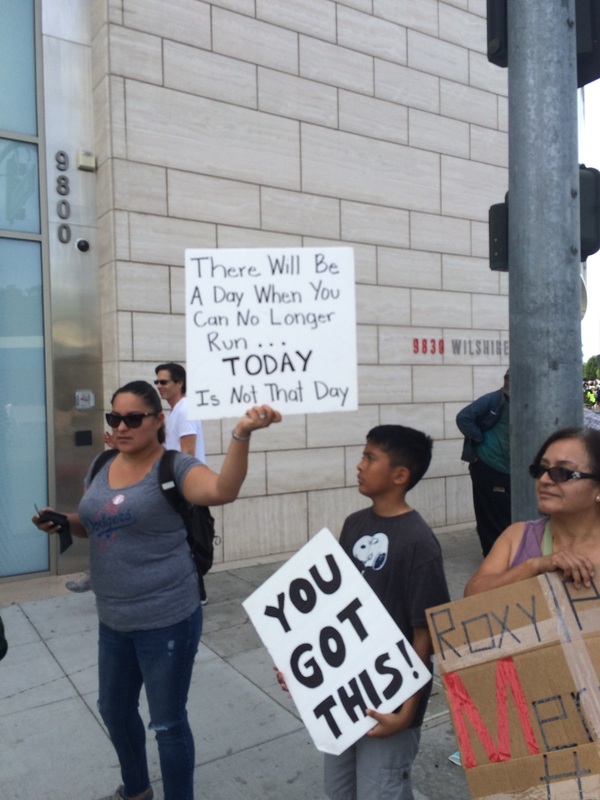 I counted at least 4 signs pointing me to the 10 freeway that were blocked off. I was really glad when my wife called me on the way home. She just let me vent. I married an awesome woman! That’s all I’ve got to say.